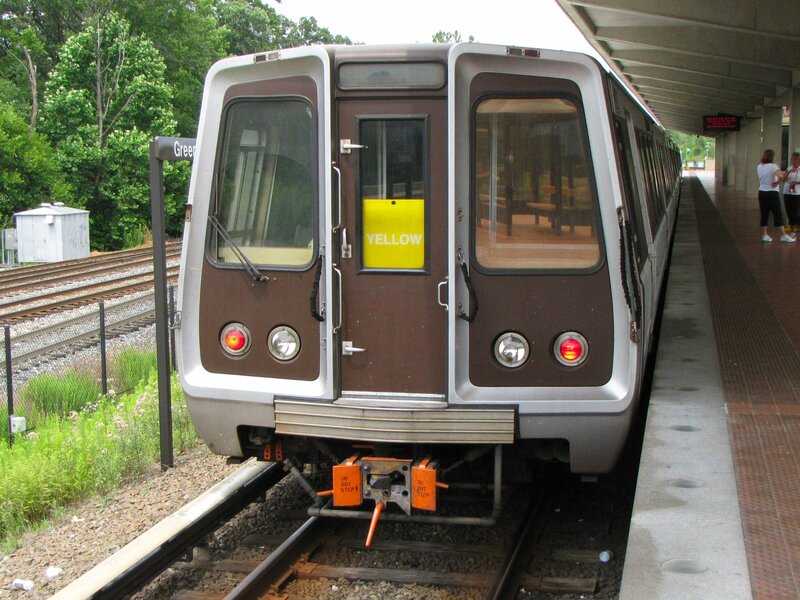 A lot of people have asked me over the years how I can identify the different types of Washington Metro (WMATA) rail cars, or as I have called it, “telling your Rohrs from your Bredas”, as well as where I find the car numbers when I do my transit log. 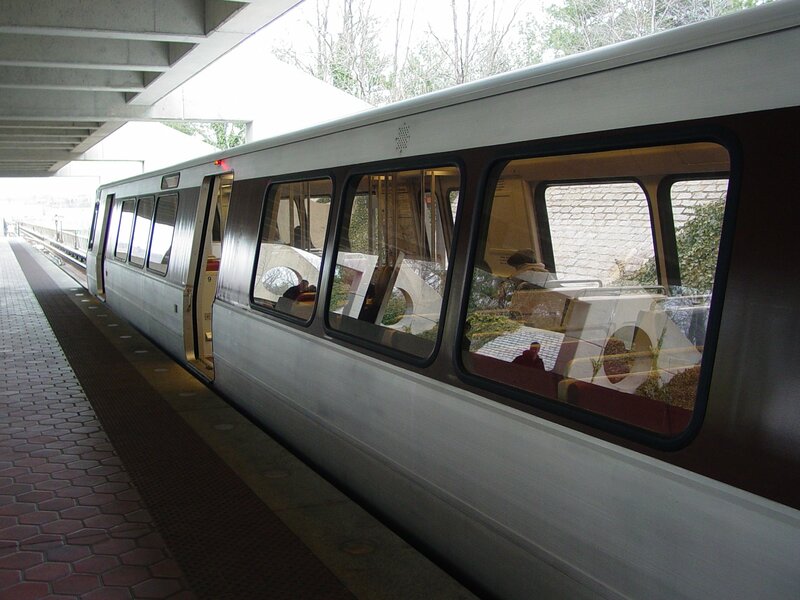 All Metro rail cars follow the same basic design model, with an aluminum exterior, a brown stripe along the sides of the cars, a brown front, transverse seating, three doors per side, and the “when boarding, please move to the center of the car” door chime. The differences between the different car types are in details. 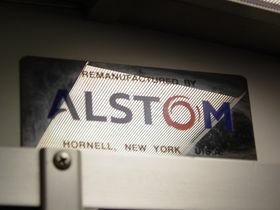 This will change in the later part of this decade when the 7000-Series rail cars are introduced, which will introduce major design changes, including a stainless steel body. 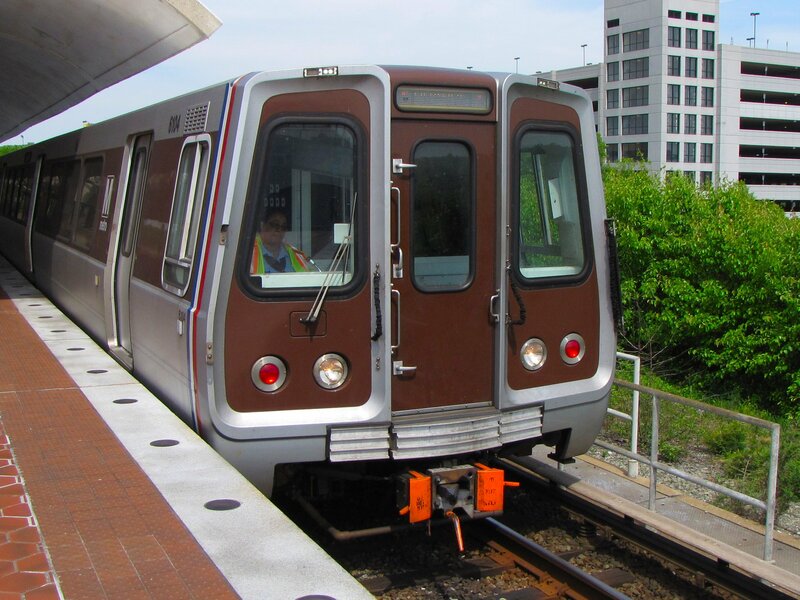 The purpose of this document is to help familiarize the average Metro rider with these details, to help facilitate easy determination of what kind of rail car a person is riding on. 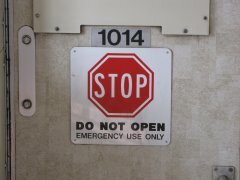 The most obvious way to tell what car type one is on is simply to look at the car number, located on the exterior of the car near the roofline at both ends of the car, and on the interior on the bulkhead doors and the emergency intercoms. The first digit determines the car series, and all cars in a given series are basically the same. The remainder of this document will outline specific features of each car series that distinguish that series from others, focusing on exterior and interior details, as well as sounds. 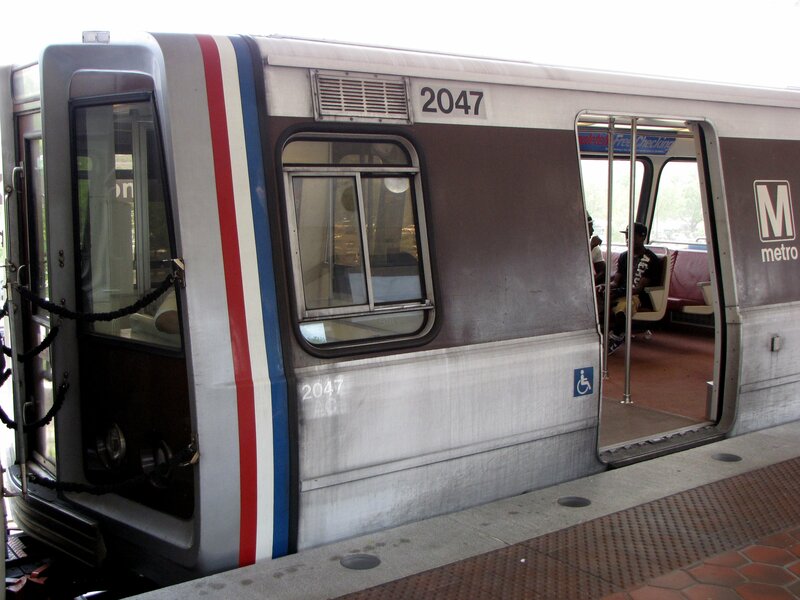 The 1000-Series is Metro’s original order of 300 rail cars. 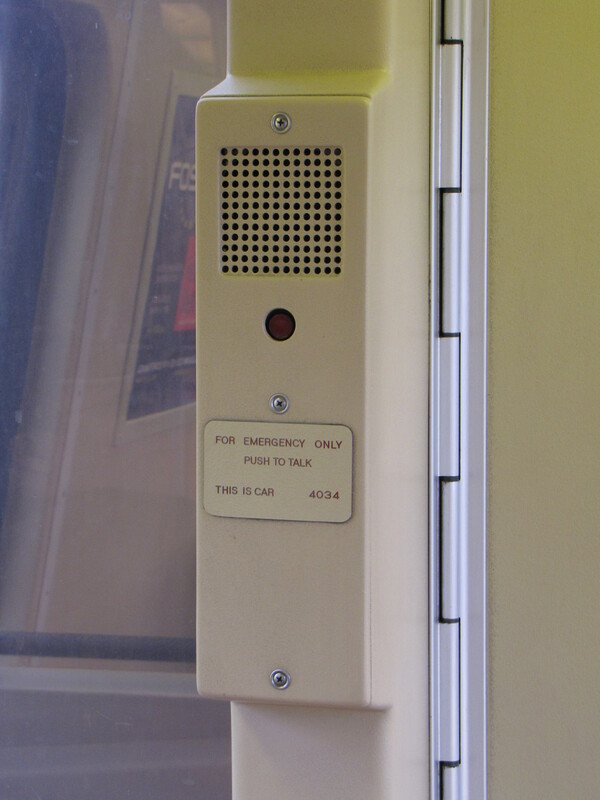 They were ordered from Rohr, Inc., and were delivered in the mid-to-late 1970s. 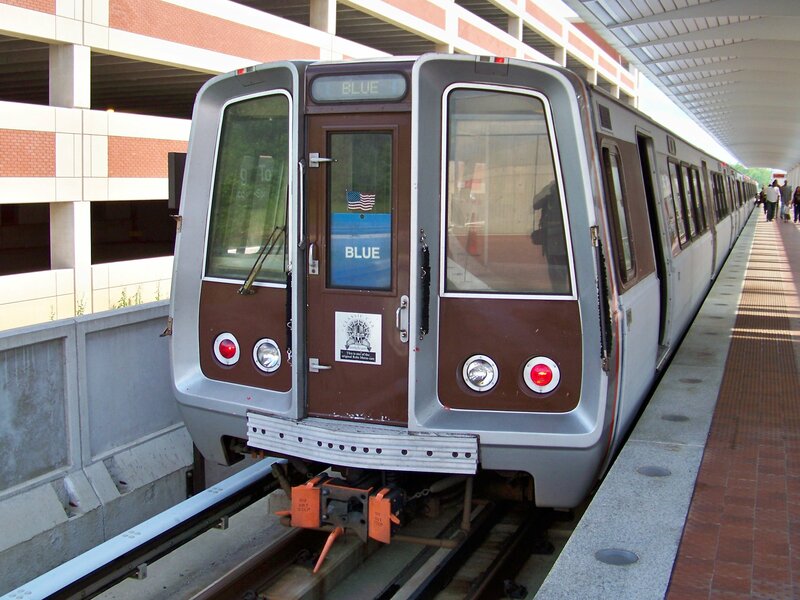 As the original rail cars, these cars have features that were changed or removed in future rail car designs. 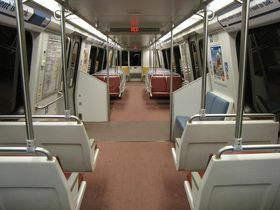 Following a collision on June 22, 2009, these cars are only found in the center of trains. These cars began to be retired in 2016. 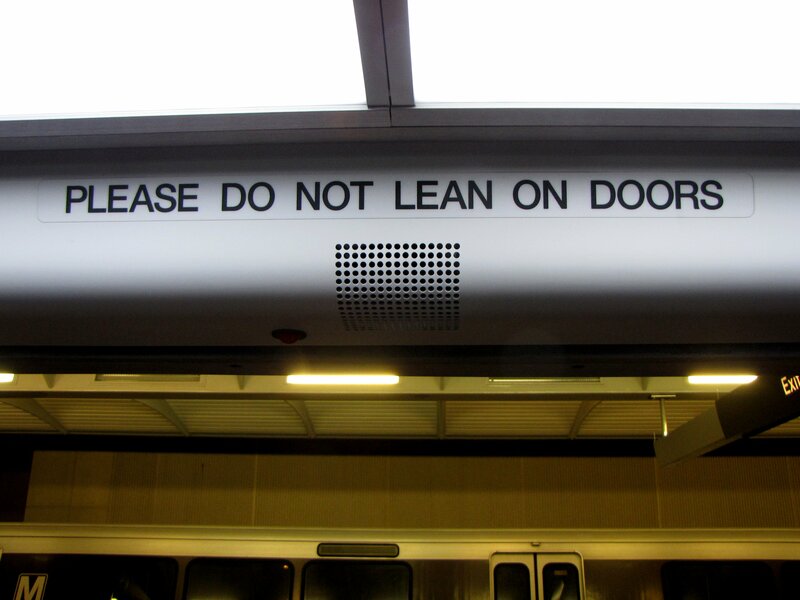 Car side: 1000-Series cars have two sign openings along the roofline, near the end doors. 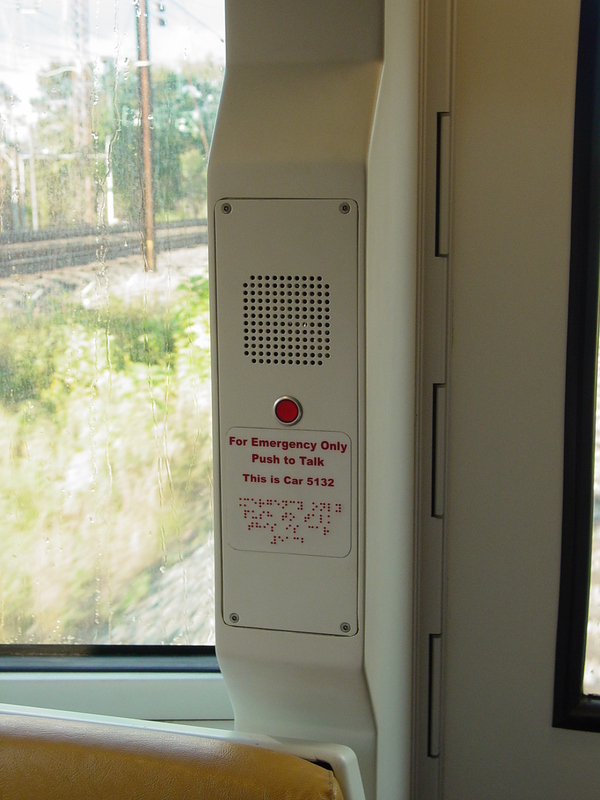 The opening on the left side is an exterior speaker, and the opening on the right side is the destination sign. 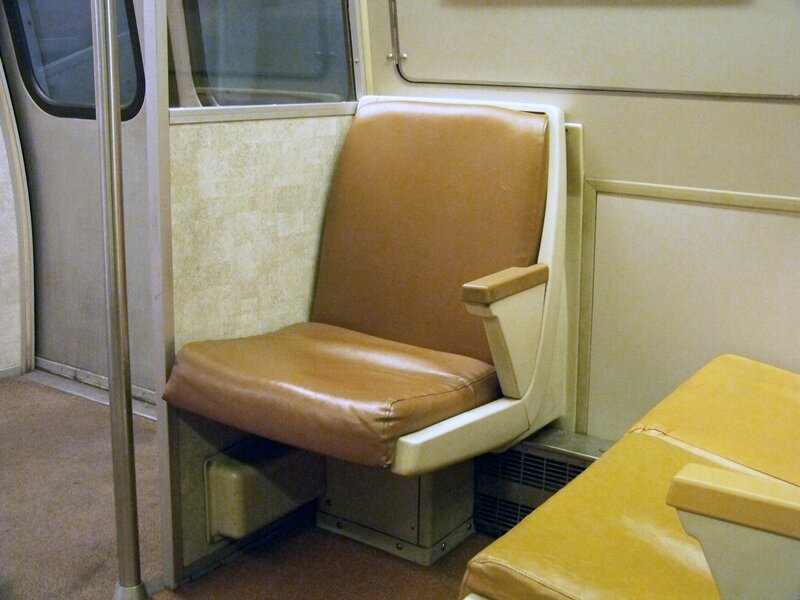 1000-Series cars are the only cars with this configuration. 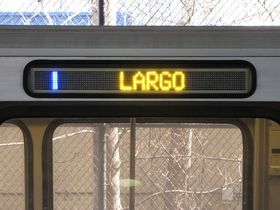 All other car series have only one sign opening containing the destination sign, located just left of the center door. Additionally, a ridge runs along the roofline along the full length of the car. 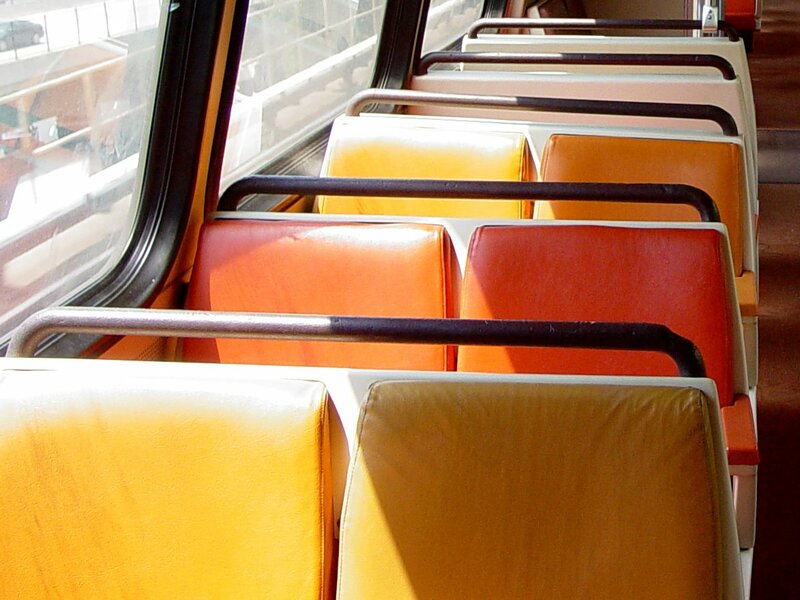 Cab windows: 1000-Series cab windows have brown frames, and contain no horizontal divisions. 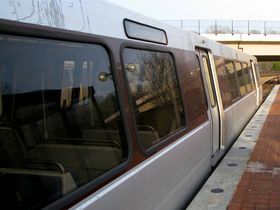 Front windows: The front windows on 1000-Series cars are rounded at the top, have an aluminum border, and extend to the roof of the car, with no brown showing above the windows. Due to these cars’ positioning in the center of trains, the front of the cars are more difficult to spot, and nearly impossible to view front-on. 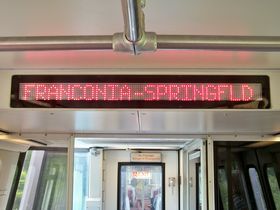 Destination signs: 1000-Series destination signs are “flip-dot“. 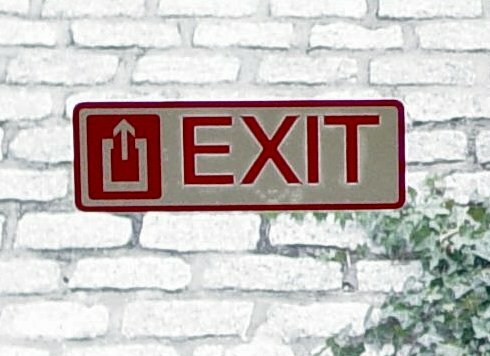 The sign window is slightly narrower than the sign itself. Due to this narrower width, for longer destination names, such as New Carrollton, Silver Spring, or in this case, Medical Center, the final letter is obscured. 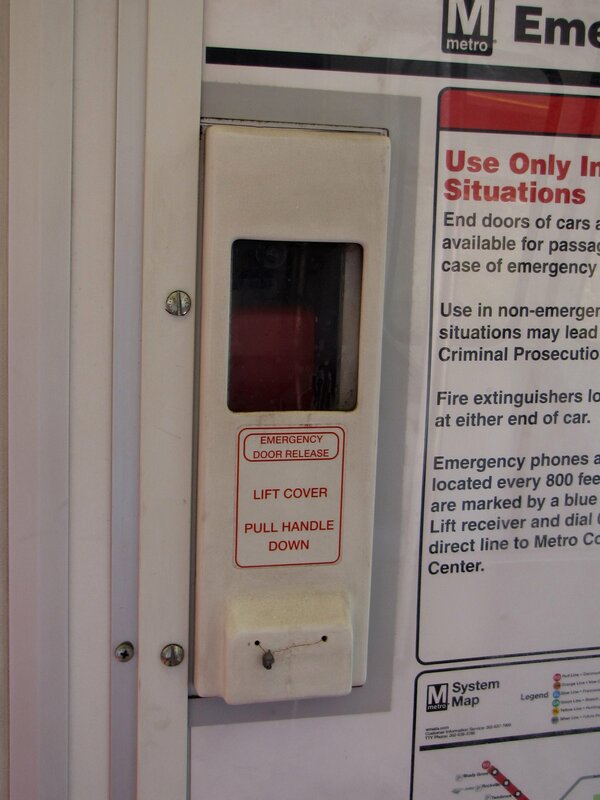 Windscreens: 1000-Series cars have a windscreen on both sides of all doors. 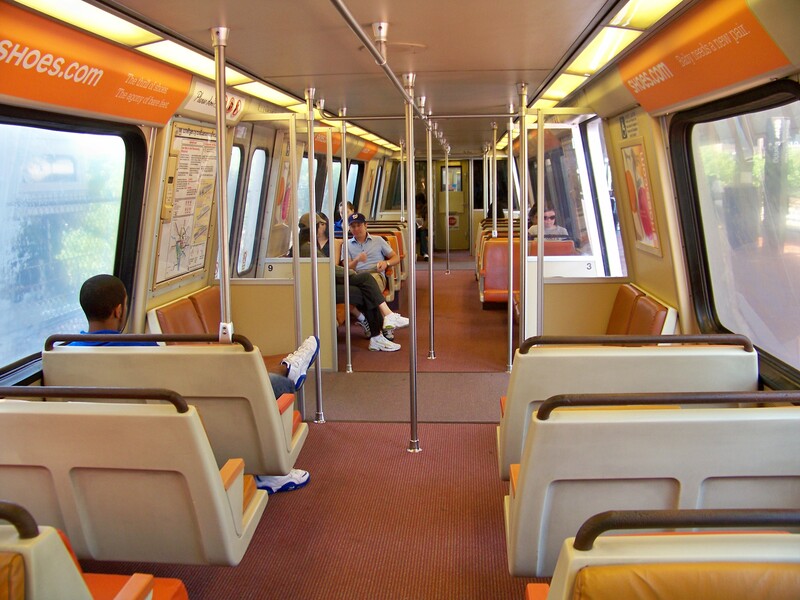 Carpet: 1000-Series cars are the only cars to have orange carpet. 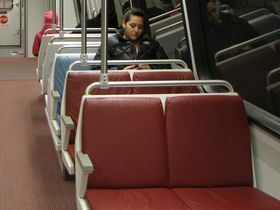 This, however, is not the case on all cars, as many have the newer pinkish-colored carpet. 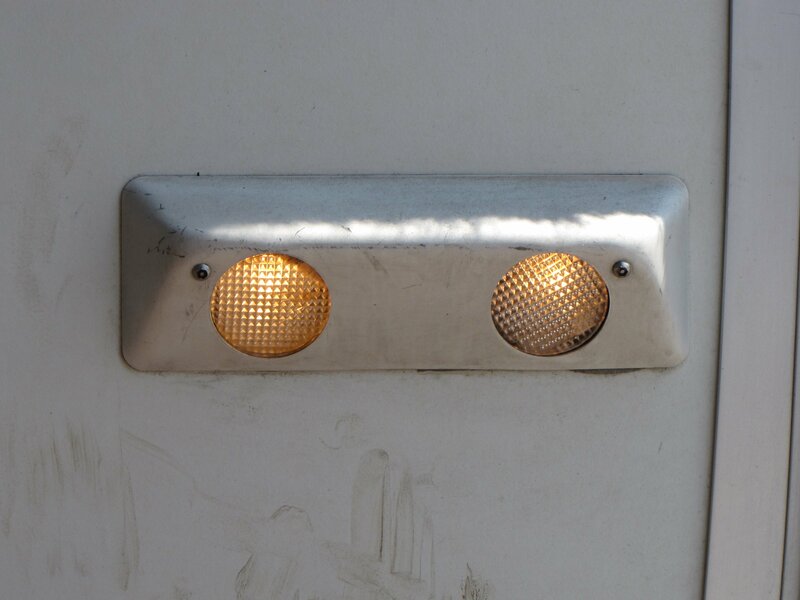 Door threshold lighting and door speakers: Door threshold lighting and door speakers are a single unit less than one foot from the floor, mounted on the windscreens. 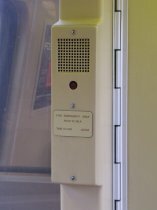 While all cars have threshold lighting of varying styles, 1000-Series cars are the only ones to have the door speakers (the speakers where the door chime plays from) at floor level. Door speakers on all other car series are located above the door. 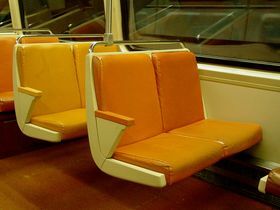 Side-facing seats: The 1000-Series has extra sideways-facing seating around the end doors, including underneath the maps. 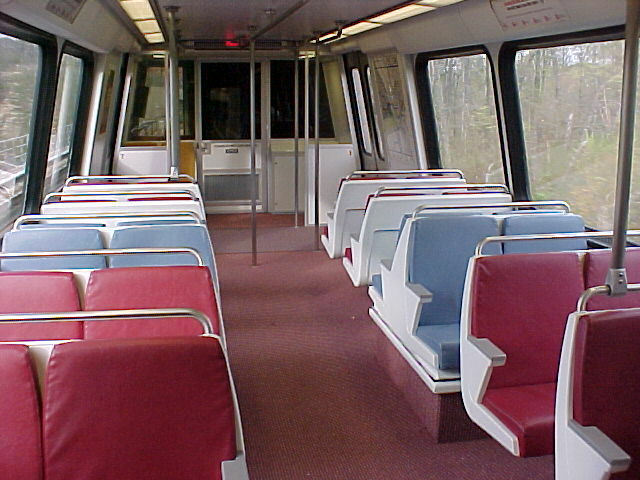 In other car series, this area is used for additional standing room. Single seats: On the same note as extra side-facing seats, the 1000-Series is also unique for its inclusion of two side-facing single-width seats at the non-cab end of the car, next to the end doors. 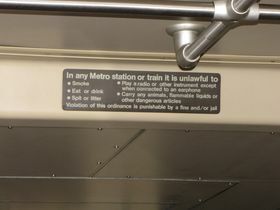 Rules sign: The rules sign on the 1000-Series is centered near the ceiling at both ends of the car. 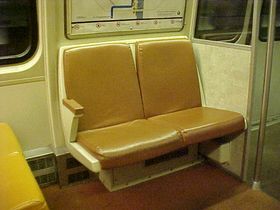 Seats: The 1000-Series is the only series where the car interior has tan walls and metal handrails on the backs of the seats. 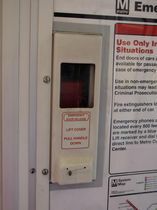 Emergency door release: On the 1000-Series, the emergency door release near the center doors is protected by a red cover that protrudes from the car wall. 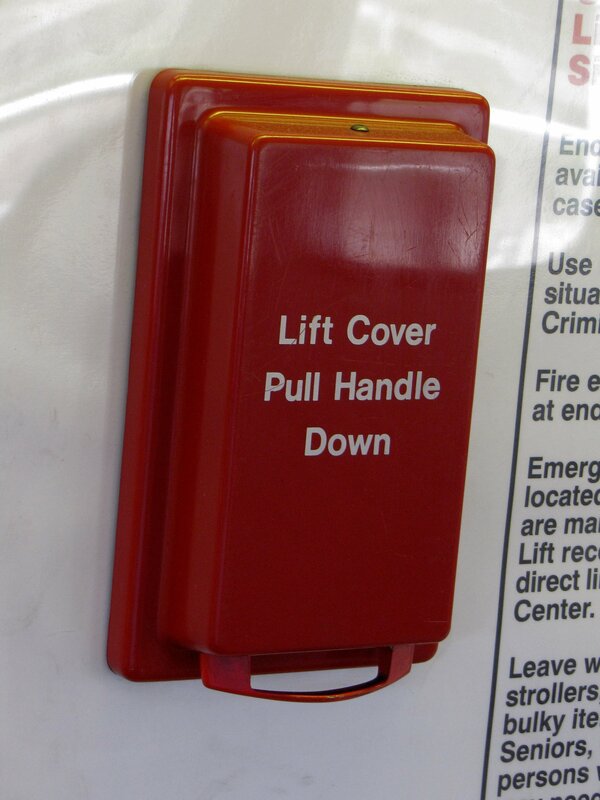 This is the only instance where a red cover is used, and the only design that protrudes from the wall. 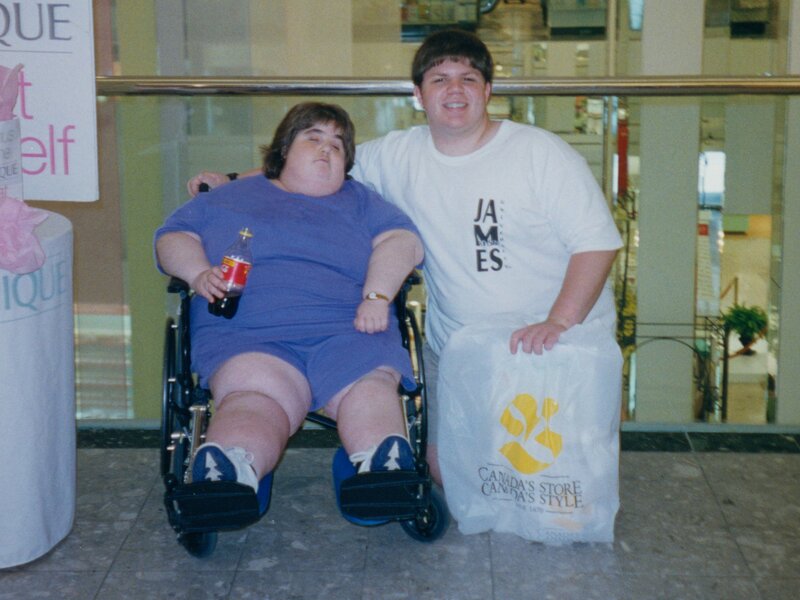 All others are flush with the wall. 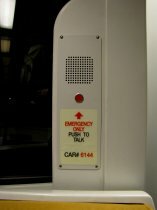 Emergency intercom: Emergency intercoms on 1000-Series cars are tan in color, have two call buttons, and have large glow-in-the-dark signage. 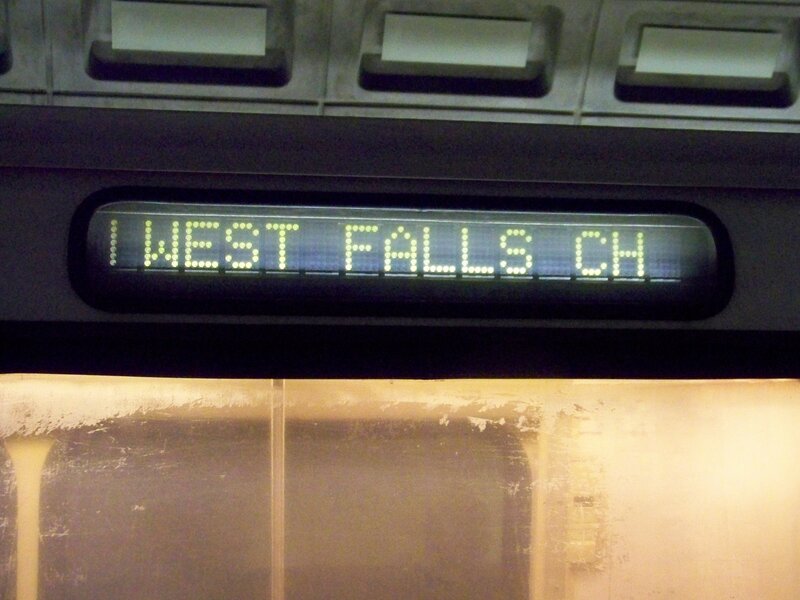 Arrival: The sound of a 1000-Series train arriving at a station. 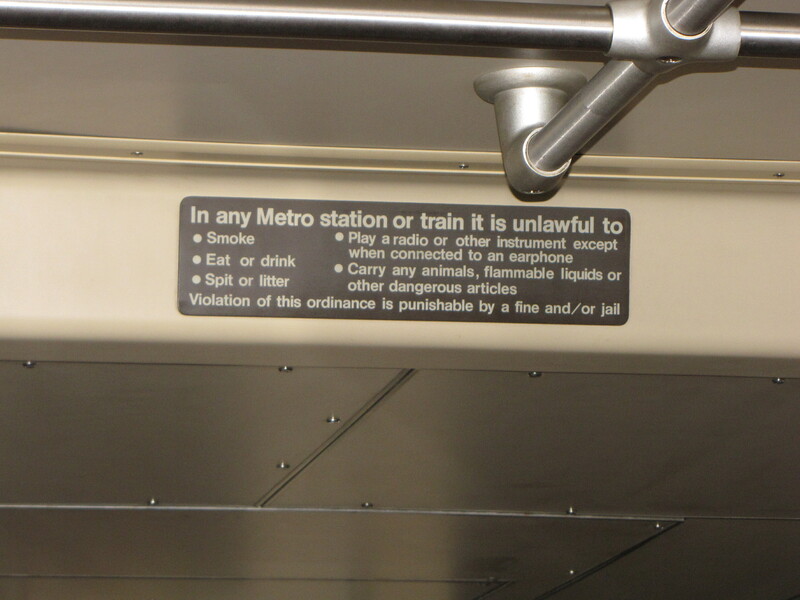 Note the three distinct sounds as the train makes the stop in a low whining sound. 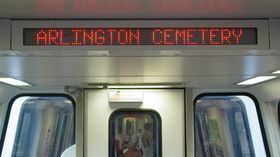 Departure: 1000-Series cars, when departing a station, make the same low whining sound as for an arrival, but in a different pattern. 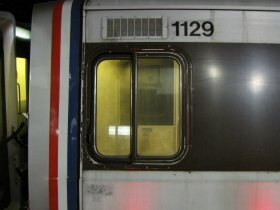 Arrival, post-accident: 1000-Series cars in their current center-of-train configuration are easily heard over other rail car types, shown here sandwiched between 3000-Series cars. 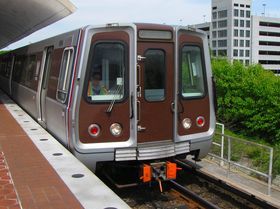 Departure, post-accident: 1000-Series cars in their current center-of-train configuration are easily heard over other rail car types, shown here between 3000-Series cars. 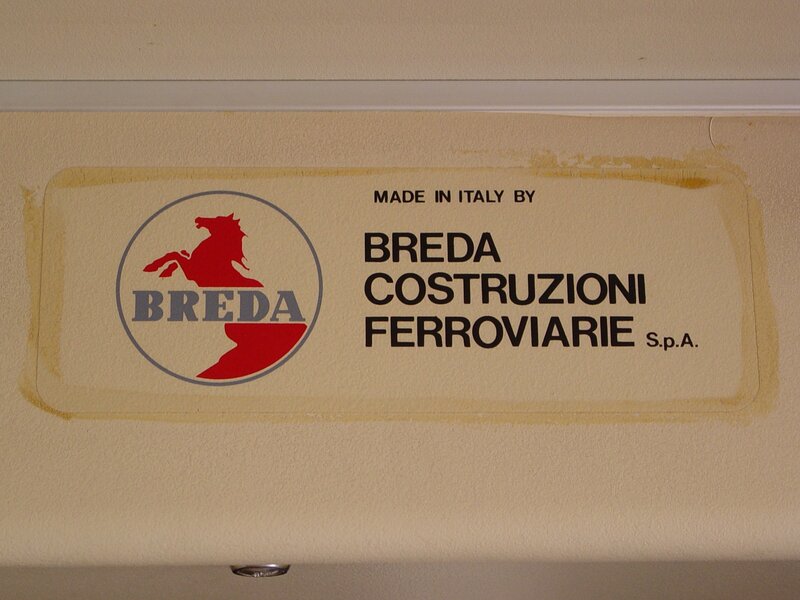 The 2000-Series and 3000-Series rail cars were manufactured in the 1980s by Breda Costruzioni Ferroviarie S.p.A. (Breda). 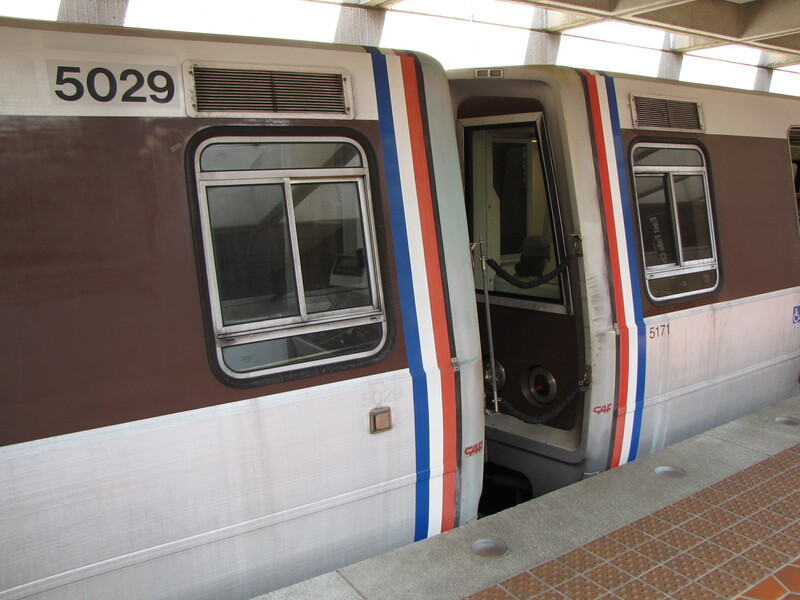 As manufactured, there were 76 2000-Series cars, and 290 3000-Series cars. 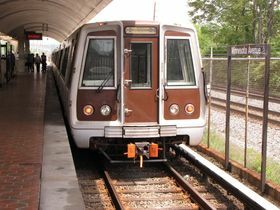 Following a rehabilitation and modernization by Alstom in the mid-2000s, the 2000-Series and 3000-Series rail cars are identical, and thus can be described together. I usually refer to these cars as “Breda rehabs”. 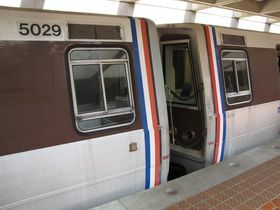 Car side: 2000 and 3000-Series cars, like all other car types except for the 1000-Series, have one sign opening just left of the center door, and contain an exterior speaker on the right half of the car. A ridge runs along the roofline for the full length of the car. 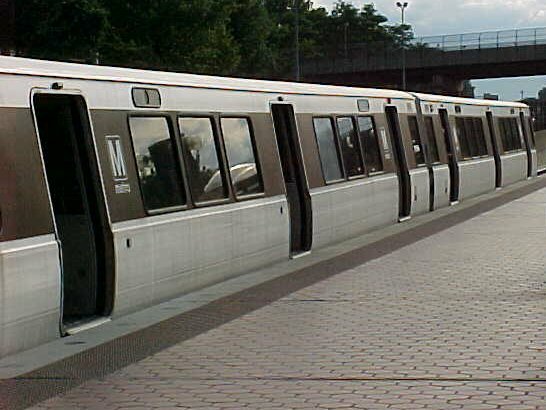 Cab windows: 2000 and 3000-Series cars have a four-paneled cab window, with two horizontal divisions. 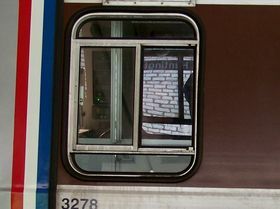 Front windows: The front windows on the 2000 and 3000-Series cars have a thin black border around them, and the border contains no curves whatsoever. 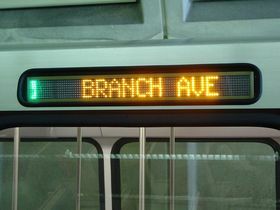 Destination signs: 2000 and 3000-Series cars have LED destination signs. 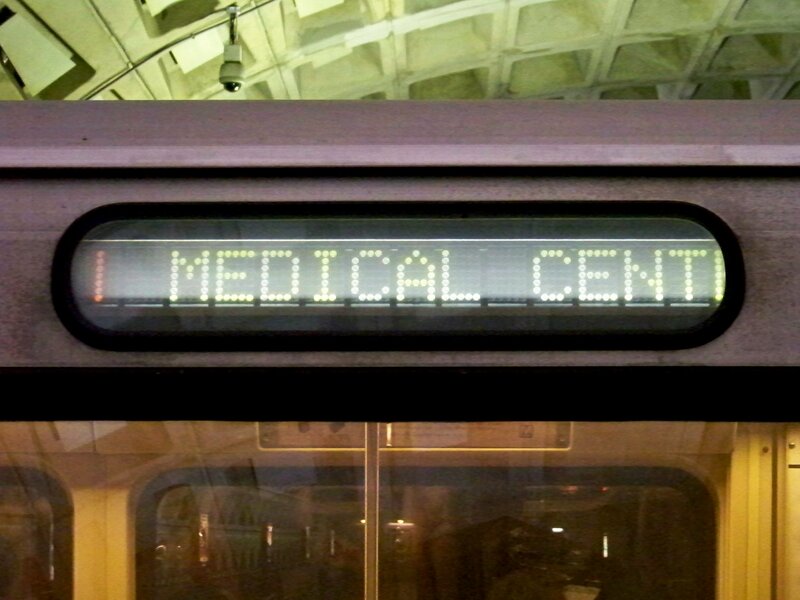 The opening for the sign is slightly larger than the sign itself. Seats: 2000 and 3000-Series cars’ seats have the color scheme of “Potomac Blue”, “Colonial Burgundy”, and “Chesapeake Sand”, have white walls, and have metal handrails on the backs of the seats. 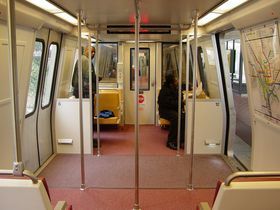 Windscreens: 2000 and 3000-Series cars have only one windscreen next to the end doors, and have no seats next to these doors. 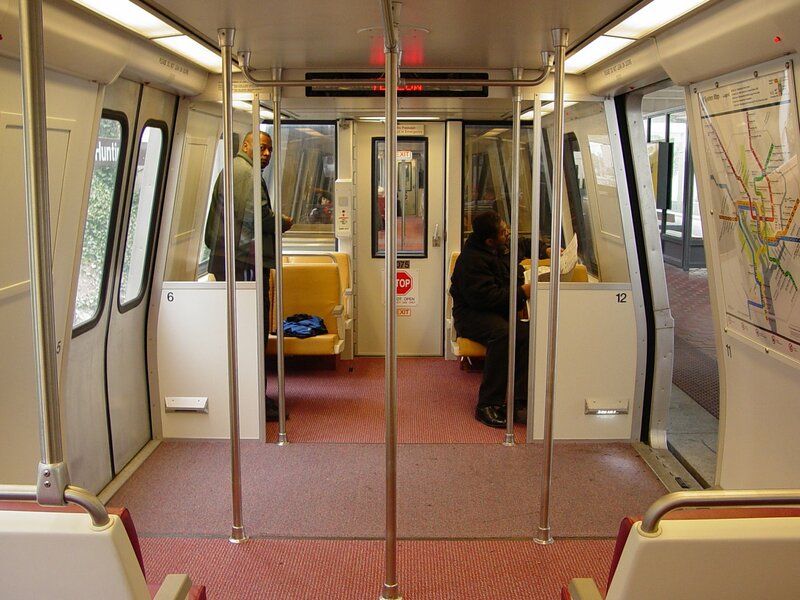 The center doors have two windscreens each. 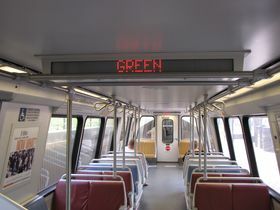 Interior LED: 2000 and 3000-Series cars have an interior LED sign at both ends of the car. 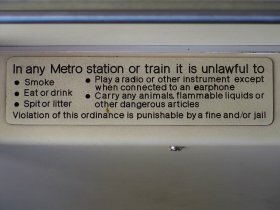 The sign is flush with the remainder of the panel that it sits in, and has a thick black border around it. 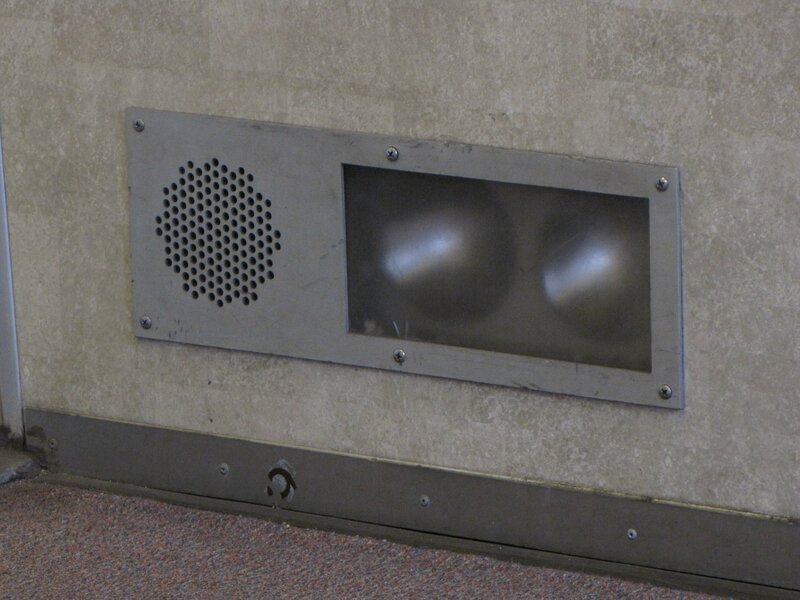 Door speakers: Like all cars other than the 1000-Series, the door speakers are located above the doors. 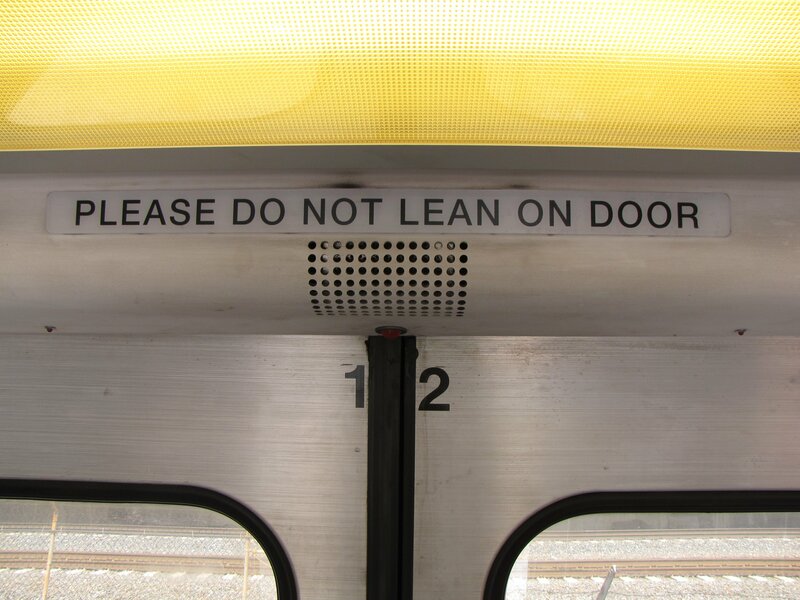 Additionally, the door warning light is offset to the left of the speaker on these cars. Door threshold lighting: The 2000 and 3000-Series’ door threshold lighting is smaller and more elongated, and directed towards the floor. 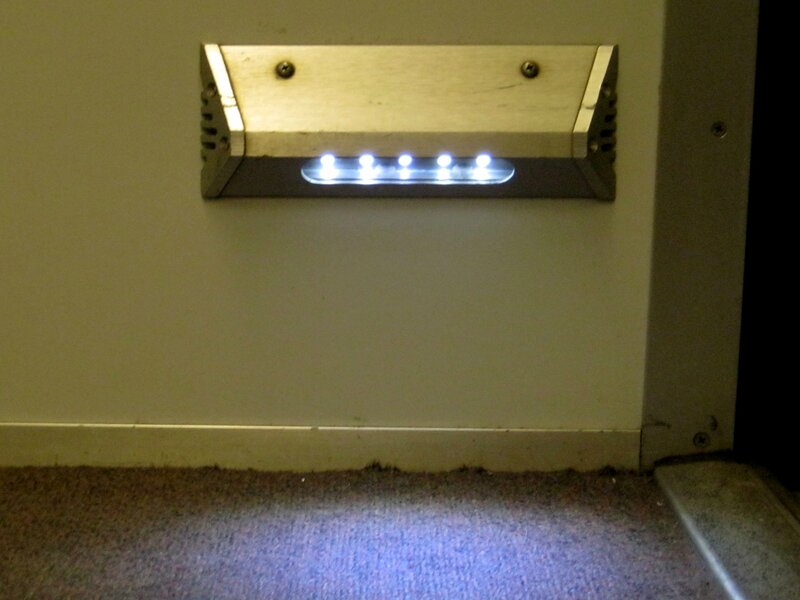 The bulbs are LED. 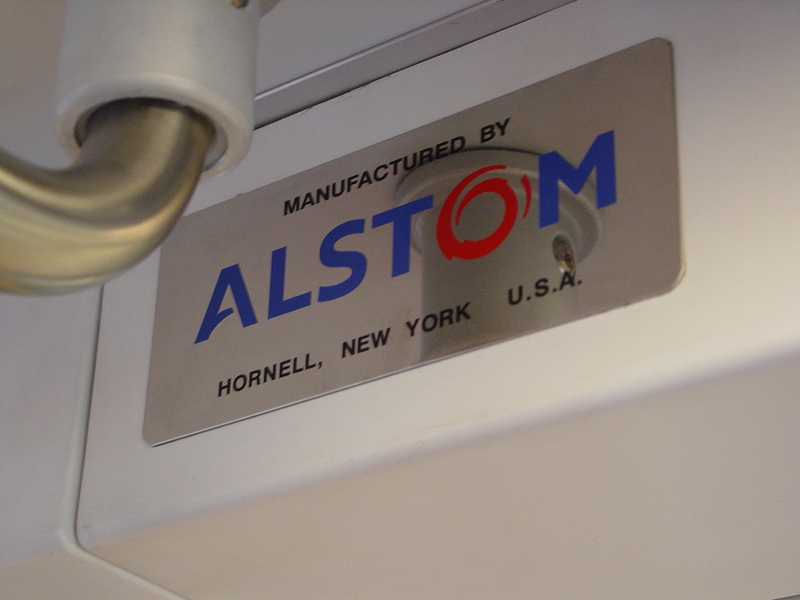 Builder’s plate: 2000 and 3000-Series cars contain a builder’s plate at the cab end of the car that reads, “Remanufactured by Alstom, Hornell, New York, USA”. 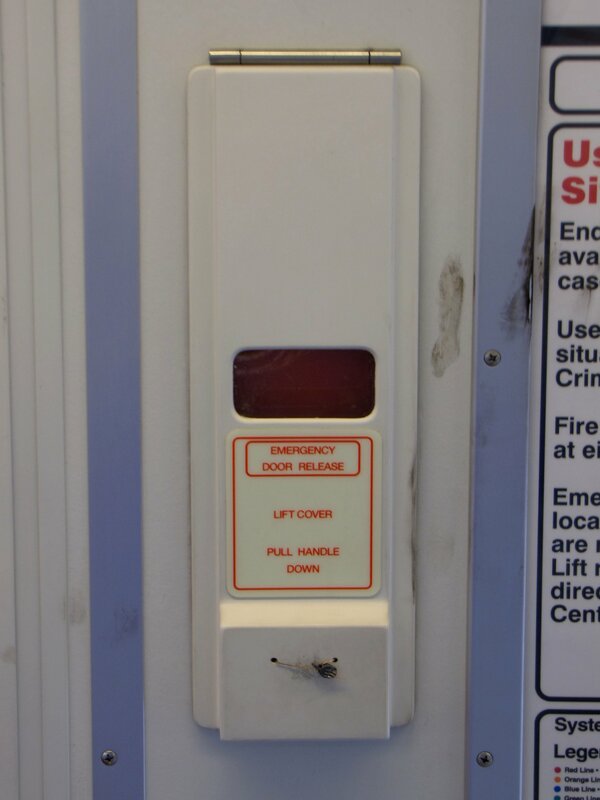 Emergency door release: The emergency door release, like all car types other than the 1000-Series, is flush with the wall. 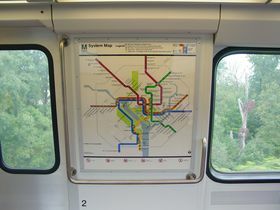 On the 2000 and 3000-Series, the cover is white, and has a small window. 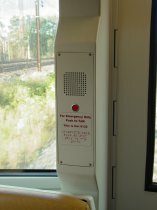 Emergency intercom: 2000 and 3000-Series cars have a white intercom with a single button, with glow-in-the-dark signage. 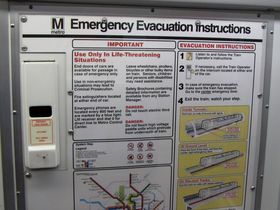 Exit signage: The 2000 and 3000-Series cars are the only car type to contain glow-in-the-dark emergency exit signage on the bulkhead doors and the left panel of the center doors. 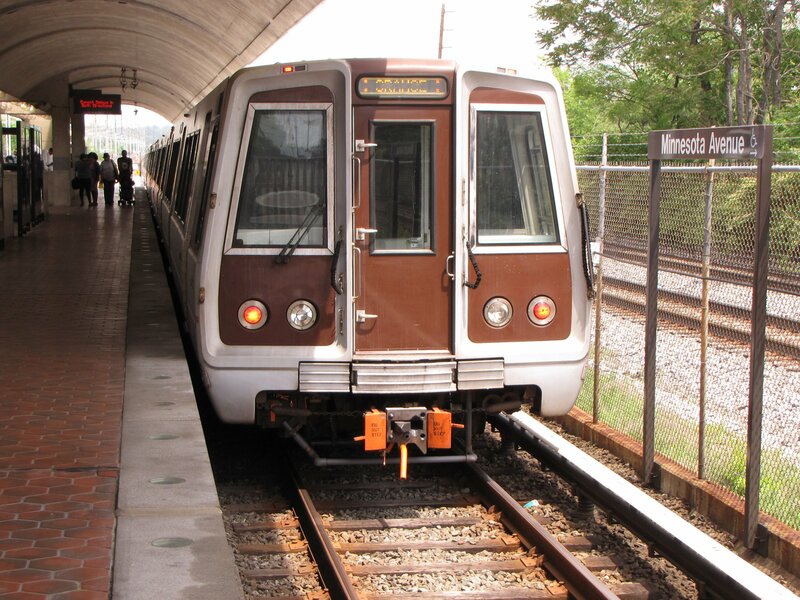 Arrival: 2000 and 3000-Series cars make a high-pitched whining sound, which changes in pitch as the train comes to a stop. 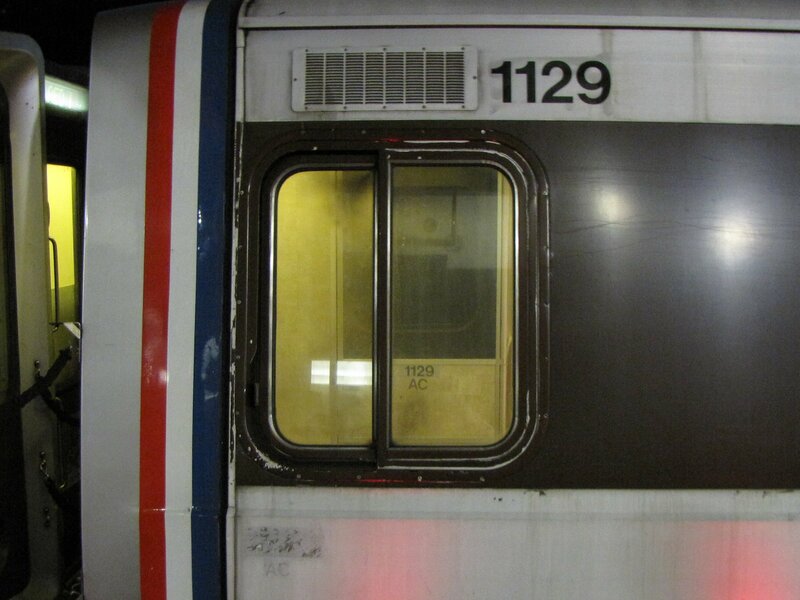 Departure: 2000 and 3000-Series cars make a high-pitched whining sound, which changes in pitch as the train accelerates. The 4000-Series rail cars were manufactured by Breda in the early 1990s. 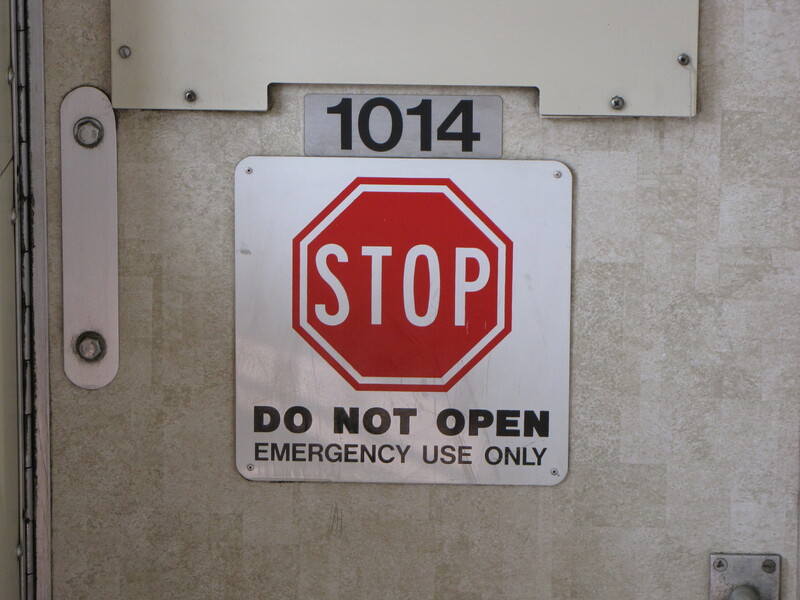 There are 100 4000-Series cars. 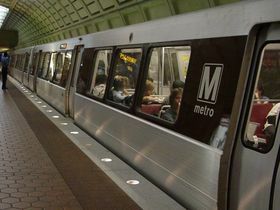 Metro has opted to forgo a mid-life rehabilitation on these cars, choosing instead to order additional 7000-Series cars to replace the 4000-Series earlier than originally planned. 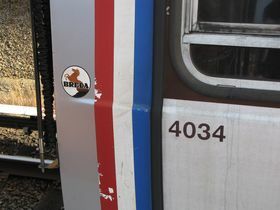 Car side: 4000-Series cars have the same placement of the destination sign just left of the center door (not pictured), but unlike all other car types, the 4000-Series has no exterior speakers. A ridge runs along the roofline for the full length of the car. 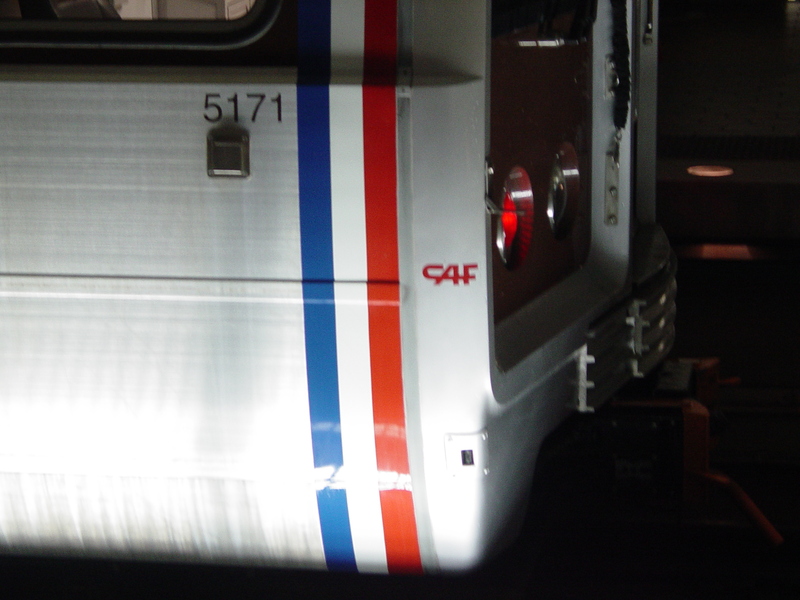 Cab windows: 4000-Series cars have a four-paneled cab window, with two horizontal divisions. 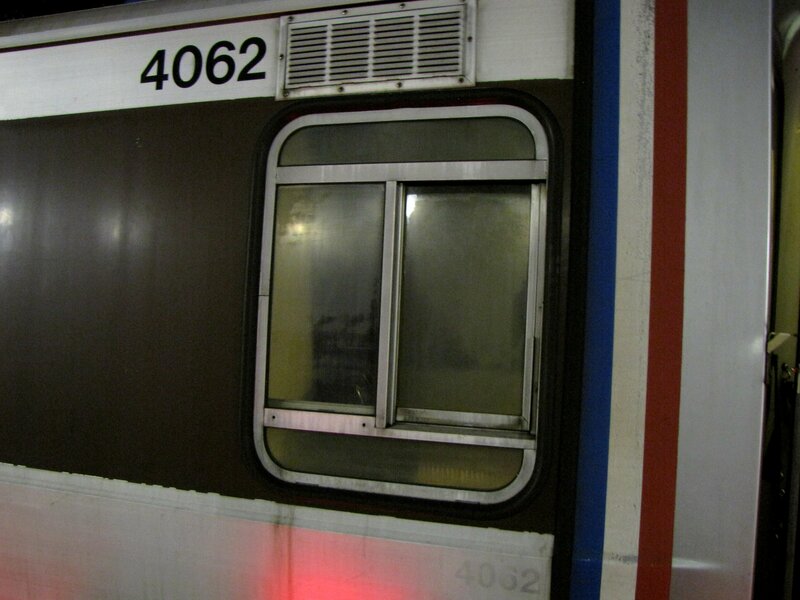 Front windows: The front windows on the 4000-Series cars have a thin black border around them, with rounded corners. 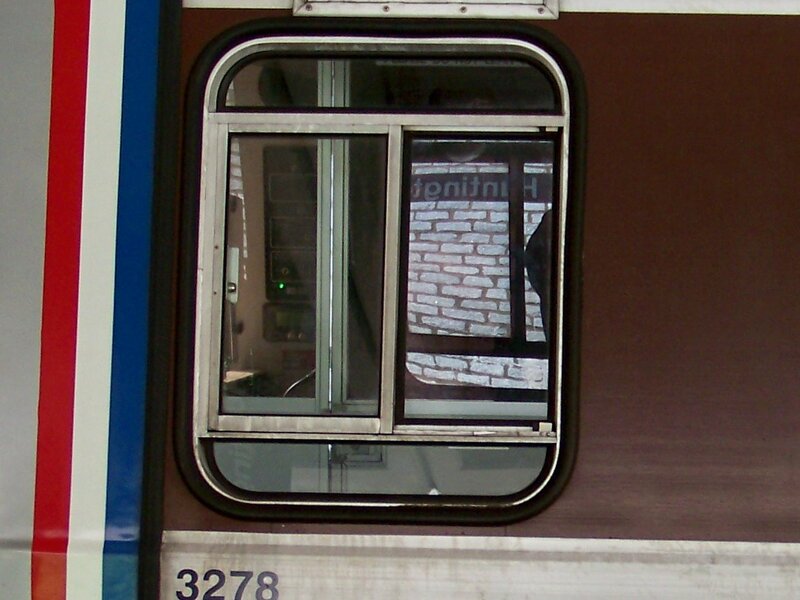 The bulkhead door window has squared corners. Destination signs: 4000-Series destination signs are “flip-dot”, identical to the 1000-Series. 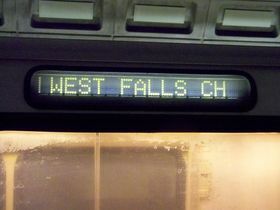 However, unlike the 1000-Series, the entire sign is visible. 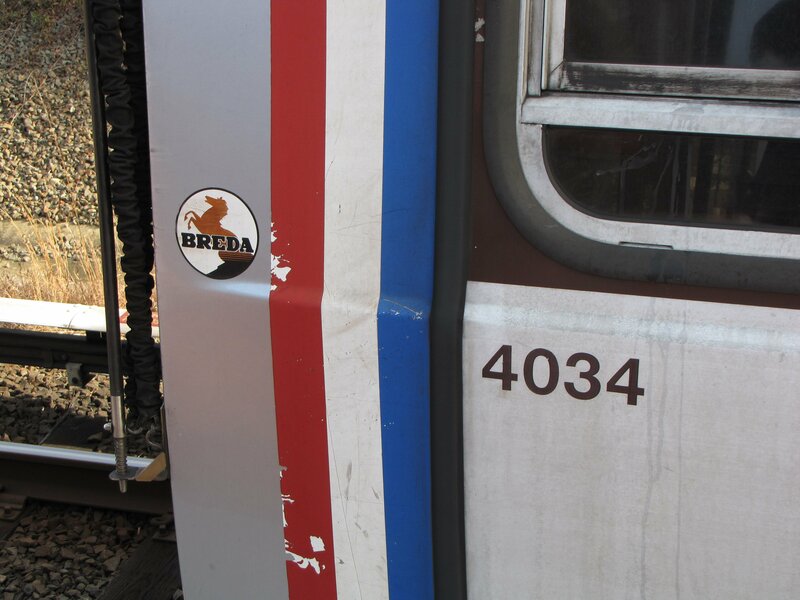 Builder’s mark: 4000-Series cars have the Breda logo on the exterior of the car, next to the cab window. 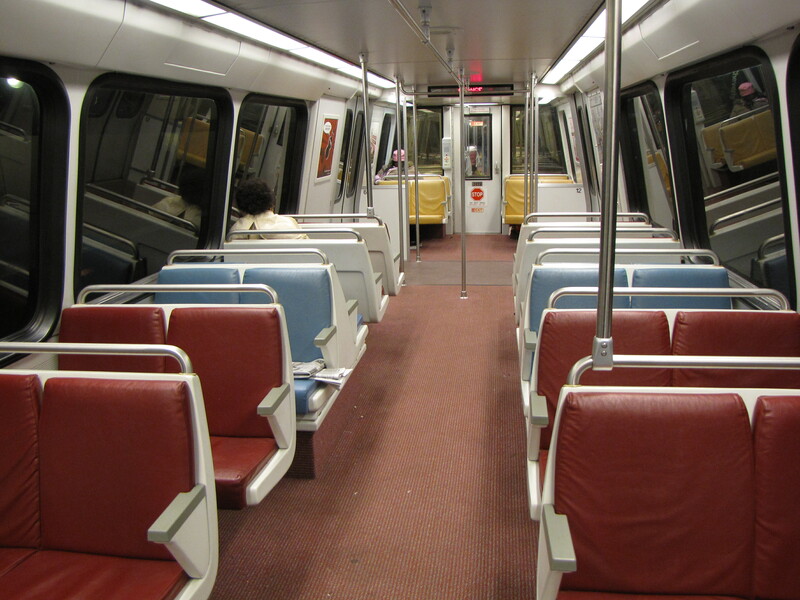 Interior: The 4000-Series has an interior layout identical to that of the 2000 and 3000-Series cars. All cars have the pinkish carpet used on the newer rail cars. Seats: With the exception of a single car pair, 4000-Series cars have orange seats with brown rubber handrails. 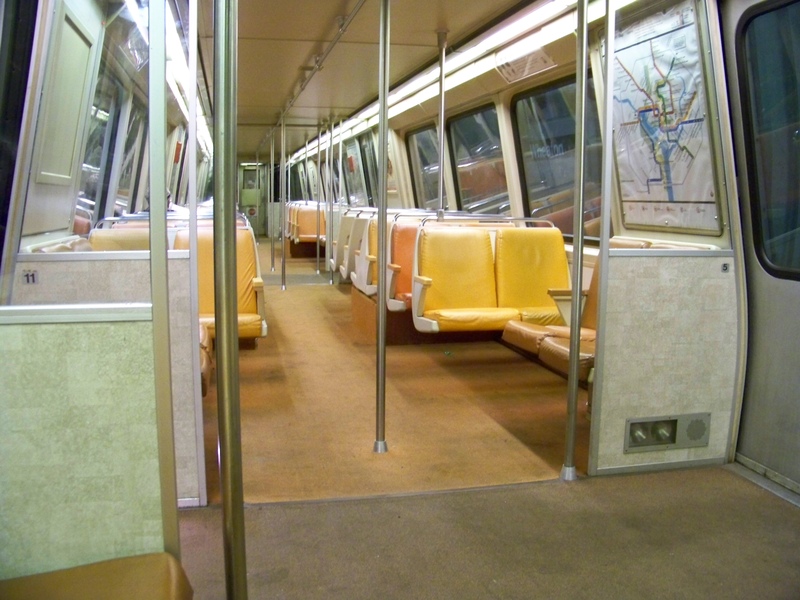 The 4000-Series is the only car type that has rubber handrails instead of metal. 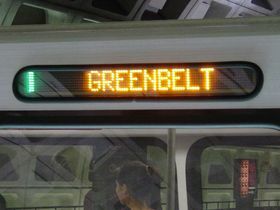 Rules sign: With no interior LED sign, the rules sign is left of the center handrail. 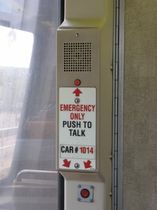 Builder’s plate: The 4000-Series cars contain a builder’s plate on the interior of the cars at the cab end, to the right of the center handrail. 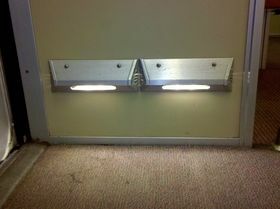 Door threshold lighting: 4000-Series cars have similar door threshold lighting fixtures as on the 2000 and 3000-Series cars, however, the 4000-Series uses incandescent lighting in the fixtures, and, unique to the 4000-Series, uses double fixtures at the end doors. 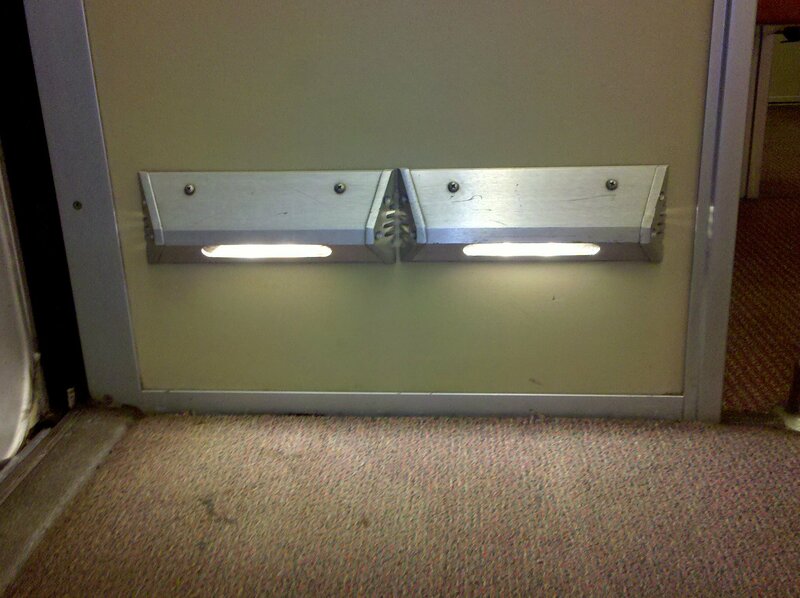 The center doors use single fixtures. 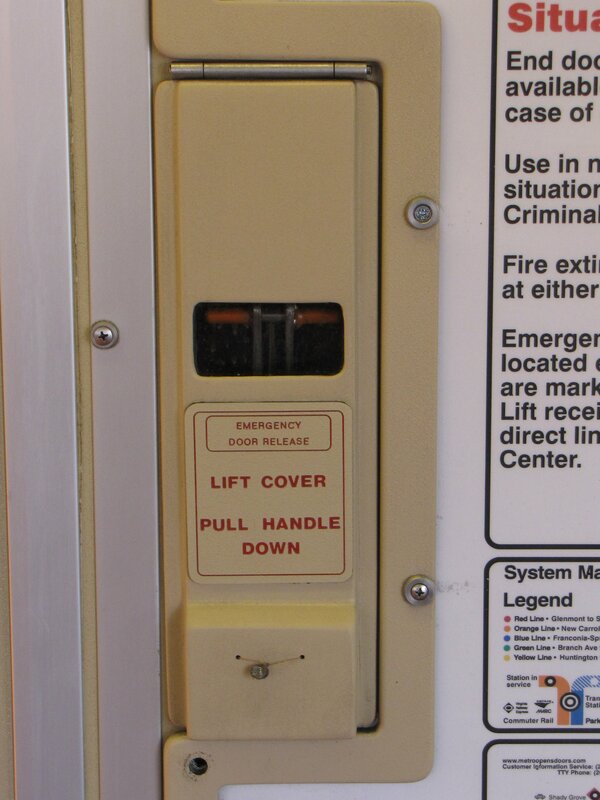 Emergency door release: The emergency door release on the 4000-Series cars is flush with the wall, tan in color, and has a tan label with red lettering. 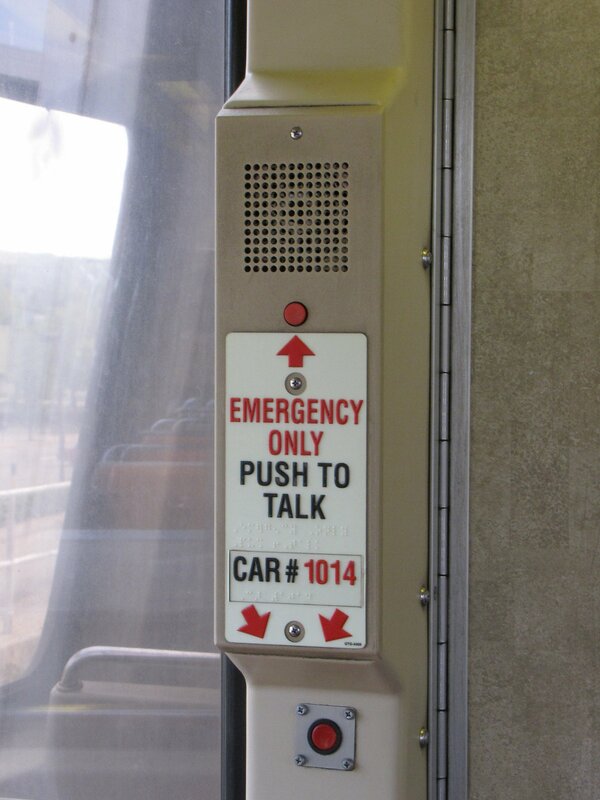 Emergency intercom: 4000-Series cars have a tan intercom with a single button. 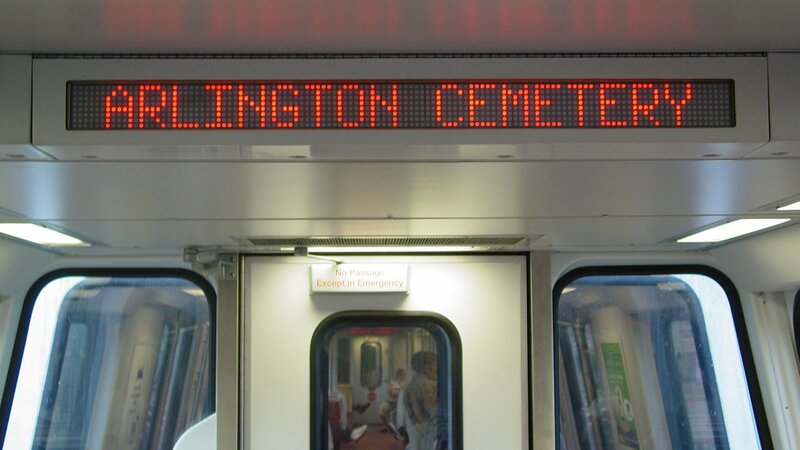 Signage does not glow in the dark. 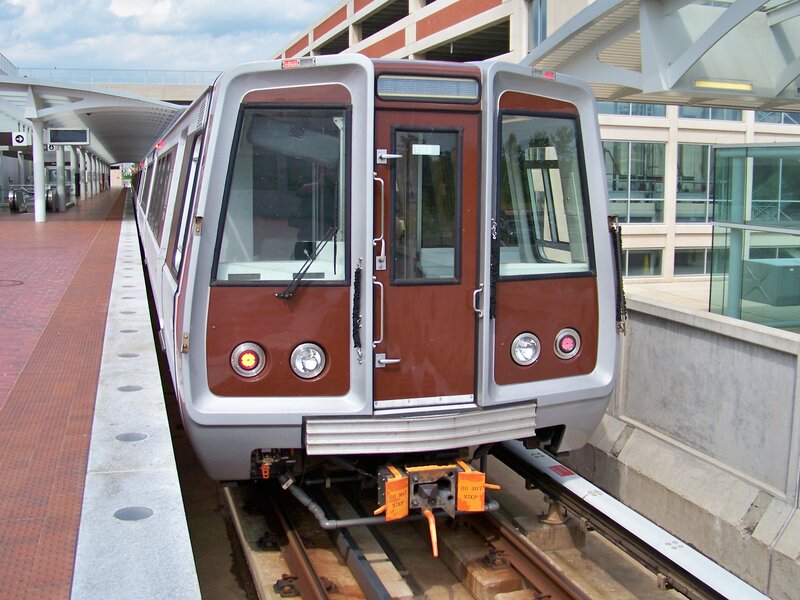 Arrival: 4000-Series cars make a constant buzzing sound when they arrive at a station. 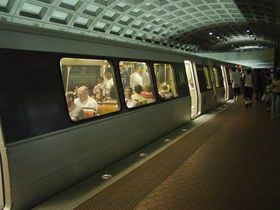 Departure: 4000-Series cars make a constant buzzing sound when they depart a station. 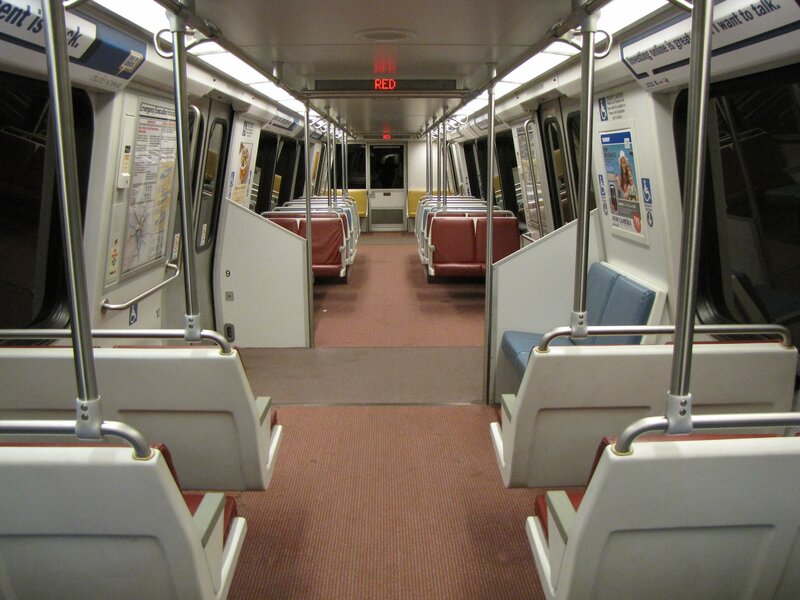 Interior: When riding a 4000-Series car, the buzzing sound is always audible whenever the train is moving. 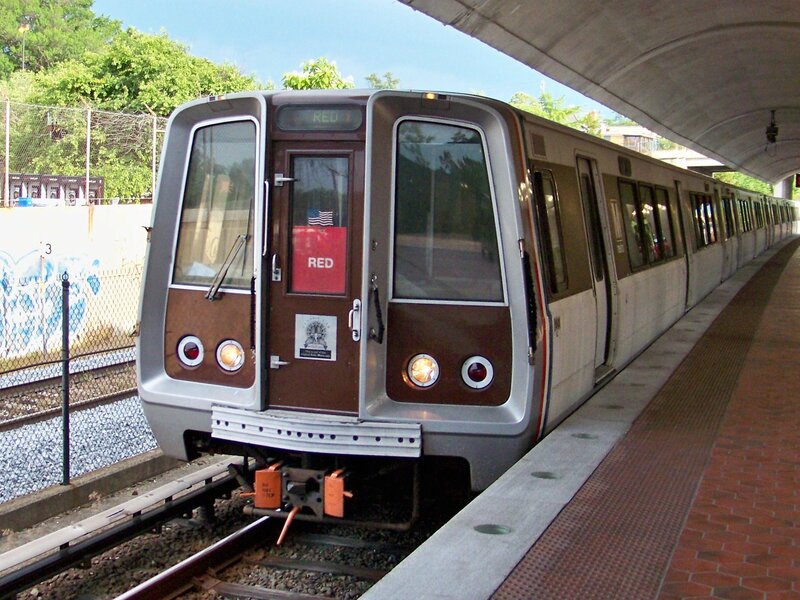 The 192 rail cars that make up the 5000-Series were manufactured by Construcciones y Auxiliar de Ferrocarriles (CAF) in the early 2000s. 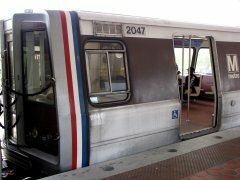 Metro has opted to forgo a rehab and retire these cars early, replacing them with additional 7000-Series railcars. Car side: The 5000-Series has the same side design as all other car types other than the 1000-Series, with the destination sign to the left of the center door, and an exterior speaker on the right side. There is no ridge along the roofline. 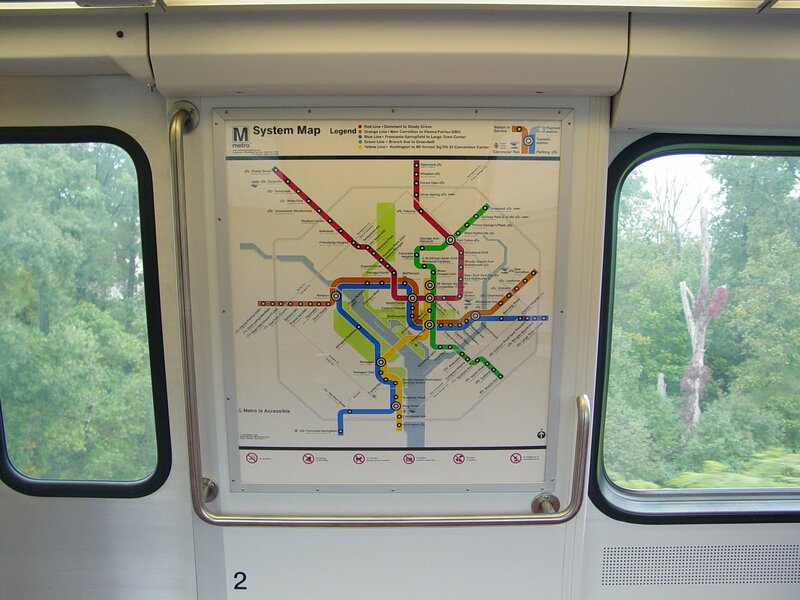 Cab windows: 5000-Series cars have a cab window identical to that of the 2000, 3000, and 4000-Series, with two horizontal divisions near the top and bottom. 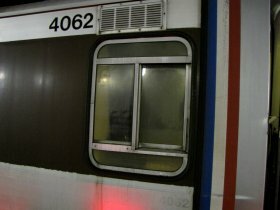 Front windows: The front windows on a 5000-Series car have thick aluminum borders, due to the wearing off of the original black paint. Like the 2000 and 3000-Series, the corners are not rounded. Some of these window borders have been repainted brown. Destination sign: Destination signs on the 5000-Series are LED, and have a shorter window than other car types. 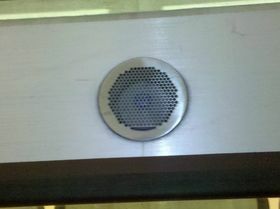 Exterior speaker: The exterior speaker is more pronounced in appearance on the 5000-Series, with the grille slightly protruding from the side of the car. 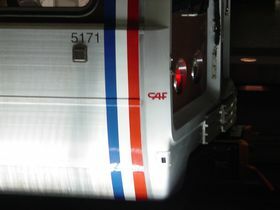 Builder’s mark: 5000-Series cars have a “CAF” marking on the exterior of the car next to the vertical striping, approximately eighteen inches lower than the cab window. Interior: The 5000-Series has an interior layout identical to that of the 2000, 3000, and 4000-Series cars, white walls, and a pinkish carpet. Seats: The seats on 5000-Series cars follow the “Potomac Blue”, “Colonial Burgundy”, and “Chesapeake Sand” color scheme, and have metal handrails on the seat backs. Interior LED: 5000-Series cars have an interior LED sign at both ends of the car. 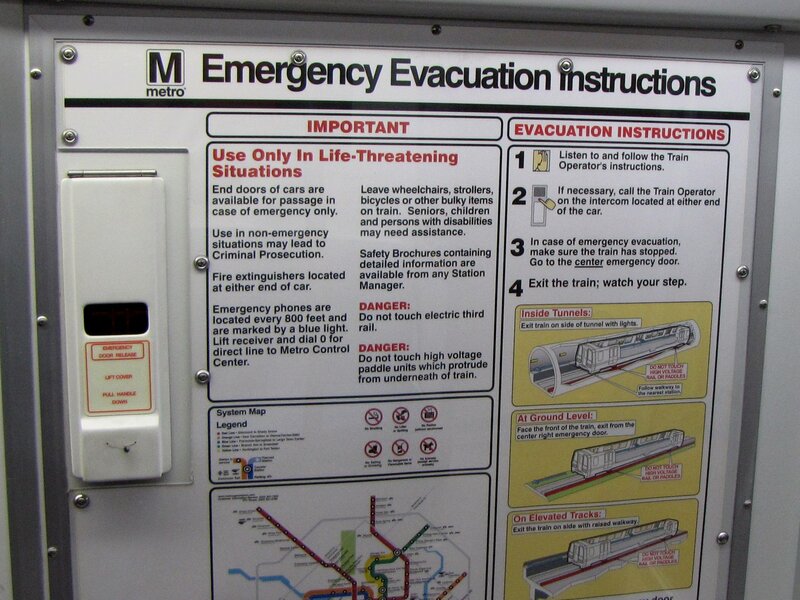 On the 5000-Series, the sign protrudes outwards from the panel that sits against. 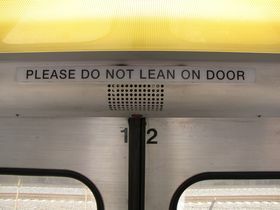 The center handrail lies inches from the sign itself, blocking view of the signs from the center of the car. 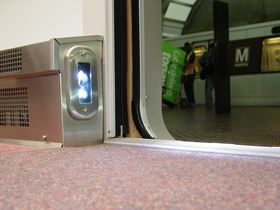 Door threshold lighting: The door threshold lighting on the 5000-Series is aimed at the floor, and has two round openings for the lights, using conventional bulbs. Door signage: The 5000-Series has slightly different door signage, reading, “Please do not lean on door”, with “door” in singular form, as compared to the plural “Please do not lean on doors” on other car types. 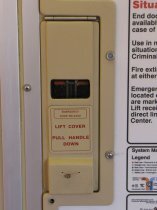 Emergency door release: The emergency door release, like all car types other than the 1000-Series, is flush with the wall. On the 5000-Series, the cover is white, and has a larger window than any other car type. 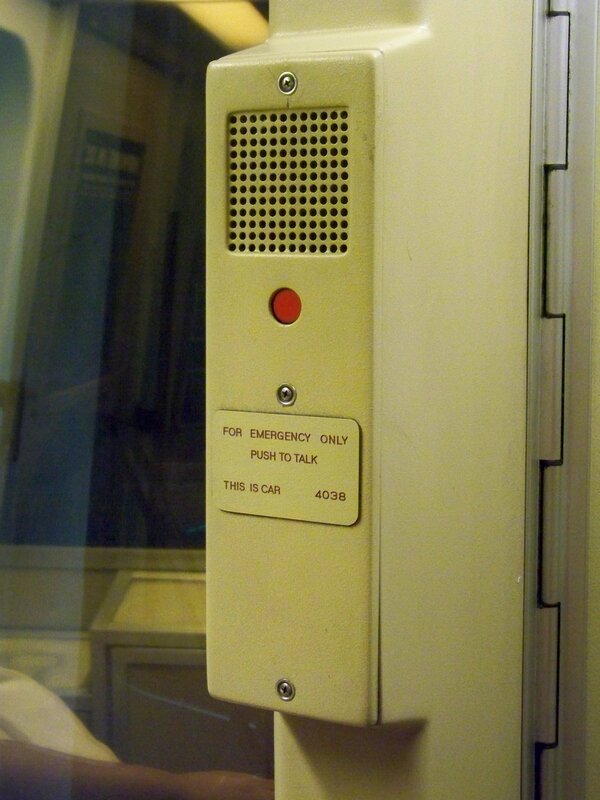 Emergency intercom: 5000-Series cars have a white intercom with a single button. 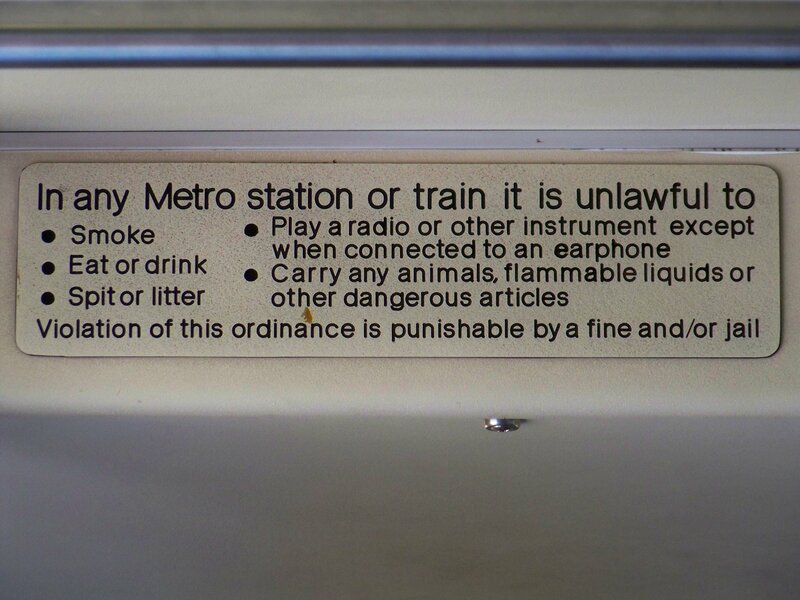 Signage does not glow in the dark. 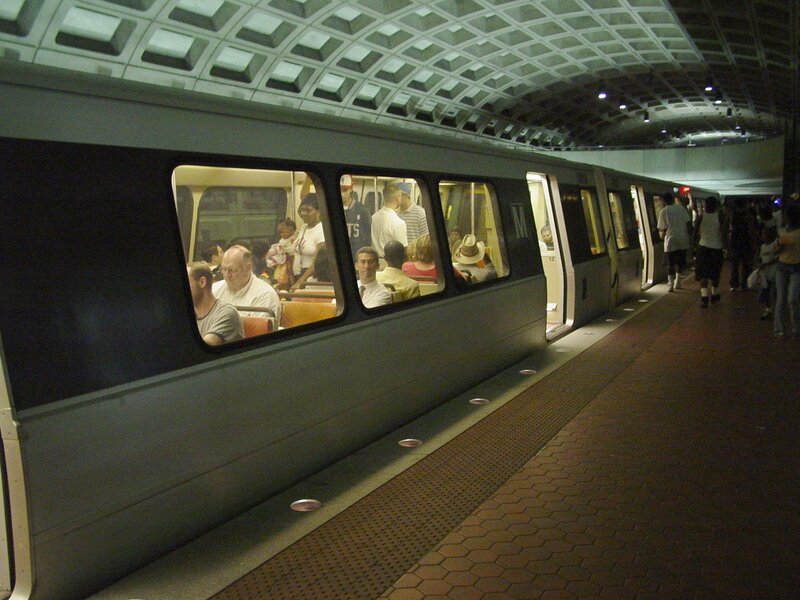 Arrival: 5000-Series cars, when arriving, make a high-pitched whining sound in three distinct stages. Departure: 5000-Series cars make a continuous high-pitched whining sound as they depart a station. The 6000-Series consists of 184 rail cars manufactured by Alstom in the mid-2000s. 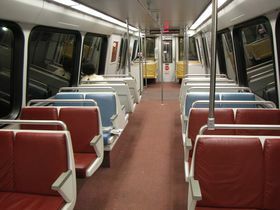 These cars were notable upon their introduction for a revised seating and handrail arrangement, with the intention of improving passenger flow through the car. 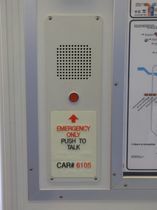 Car side: The 6000-Series has the same basic side design as all other car types other than the 1000-Series, with the destination sign to the left of the center door, and an exterior speaker on the right side. 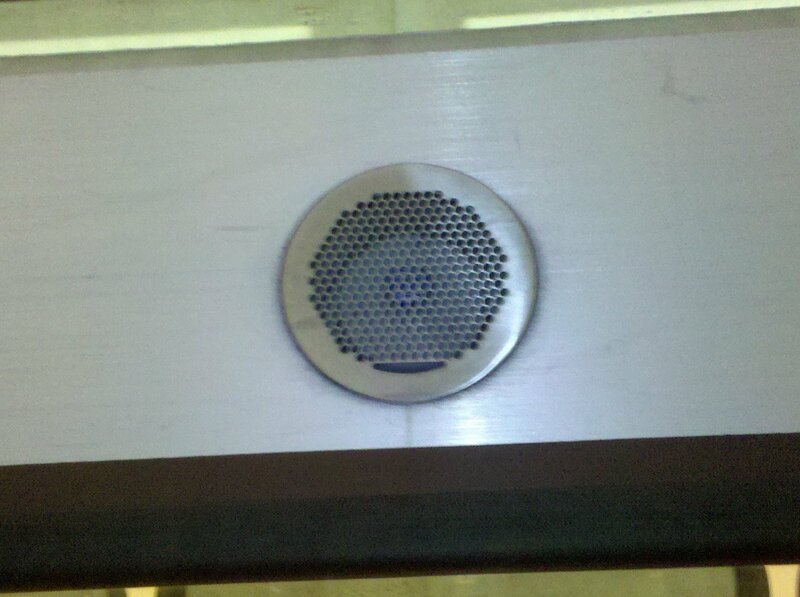 Like the 5000-Series, this exterior speaker slightly protrudes from the car side. Additionally, there is no ridge along the roofline of the car. Cab windows: 6000-Series have a three-panel window, with only one horizontal division on the cab windows, near the bottom of the window. 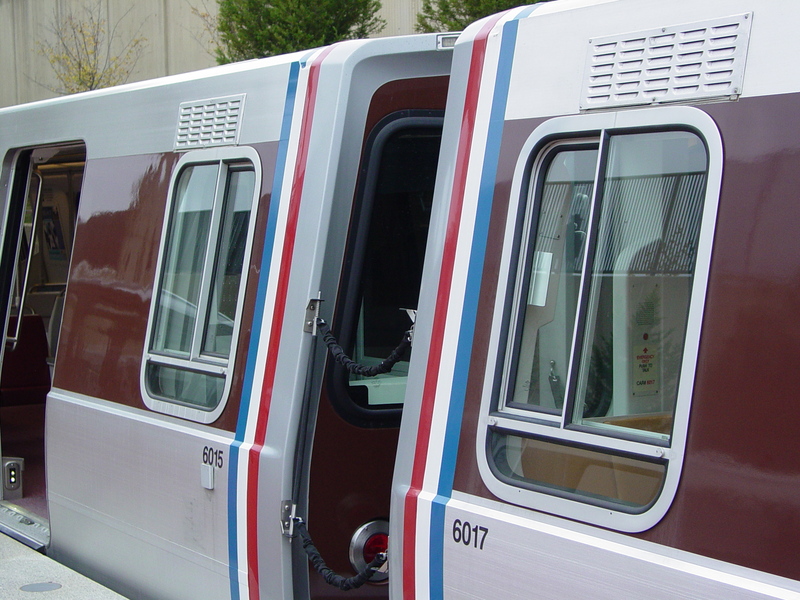 Front windows: The front windows on the 6000-Series cars have a thick black border around them, with rounded corners. The bulkhead door window also has rounded corners. 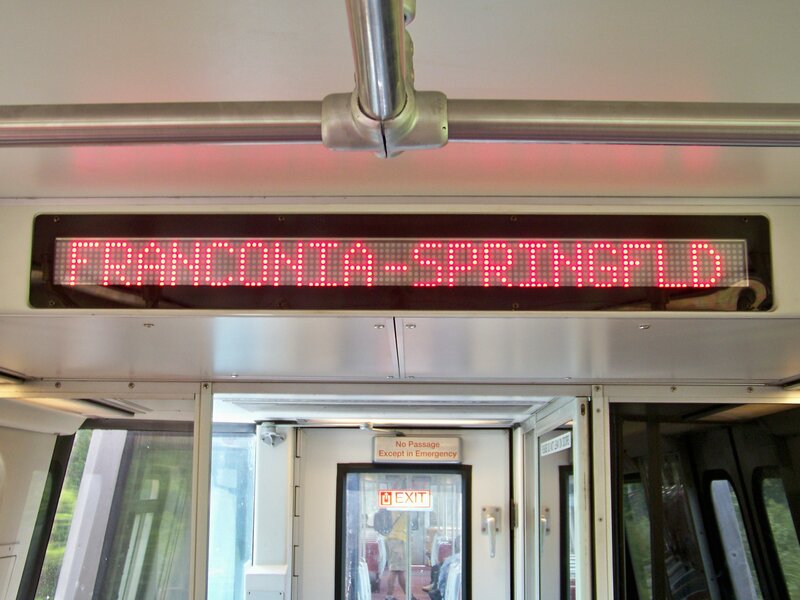 Destination signs: 6000-Series cars have LED destination signs. 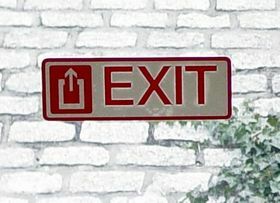 The opening for the sign is slightly larger than the sign itself. 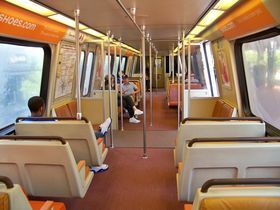 Interior: The 6000-Series has a different layout from other car types in an effort to improve passenger flow. 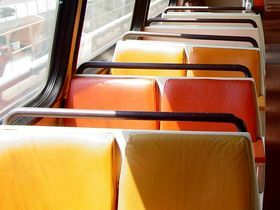 There are no windscreens, only two pairs of side-facing seats at the center of the car, a double handrail along the ceiling, and more seat-back-to-ceiling poles. 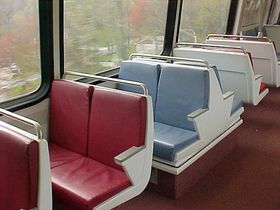 Seats: The seats on 6000-Series cars follow the “Potomac Blue”, “Colonial Burgundy”, and “Chesapeake Sand” color scheme, and have metal handrails on the seat backs. 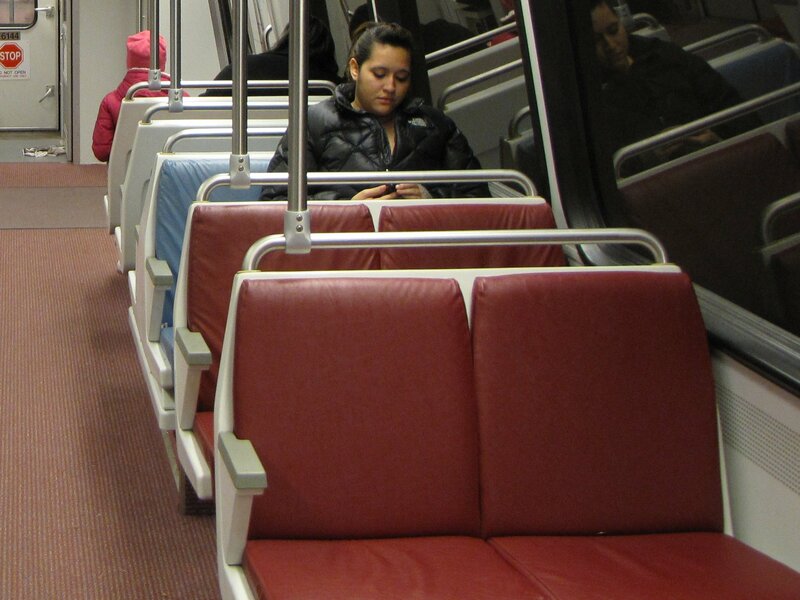 Additionally, most seats have a pole running from the seat back to the ceiling. 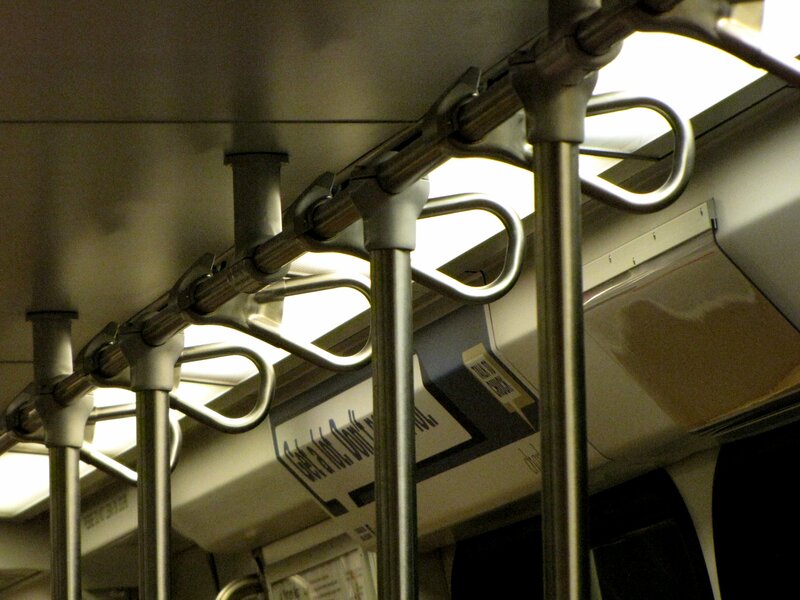 Wall bars: The 6000-Series is the only car type to have wall-mounted grab bars. Ceiling handles: The 6000-Series is the only car type to have spring-loaded handles mounted on the ceiling handrail. 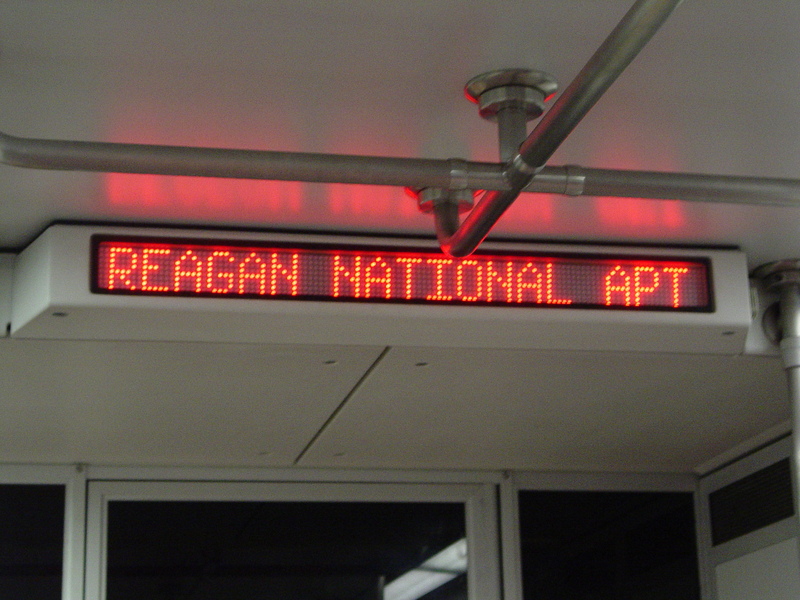 Interior LED: 6000-Series cars have an interior LED sign at both ends of the car. 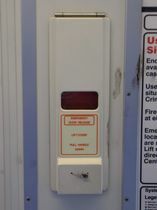 The sign is flush with the panel that it sits in, and has a white border around it. 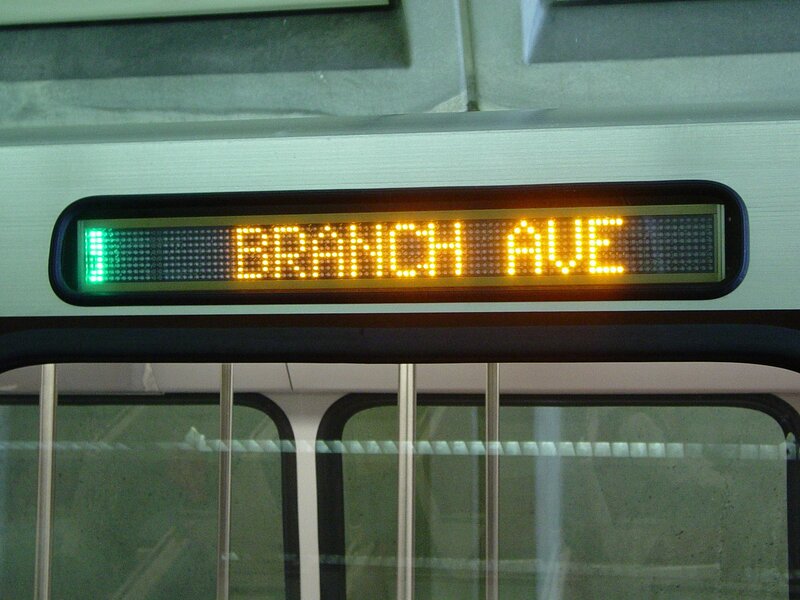 Center interior LED: The 6000-Series is the only car type to have an additional LED sign at the center of the car. Door threshold lighting: Due to the lack of windscreens, the 6000-Series’ door threshold lighting is closer to the ground, with two LEDs stacked vertically. Builder’s plate: 6000-Series cars contain a builder’s plate at the cab end of the car that reads, “Manufactured by Alstom, Hornell, New York, USA”. 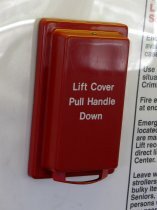 Emergency door release: Like all car types other than the 1000-Series, the emergency door release handle is flush with the wall. 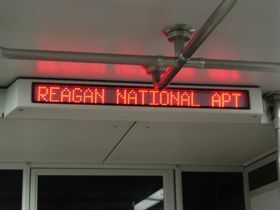 On the 6000-Series, the cover is white, and has a small window. Emergency intercoms: The emergency intercoms at the ends of the cars on the 6000-Series are located next to the door frame for the bulkhead door, rather than on the door frame as in other car types. 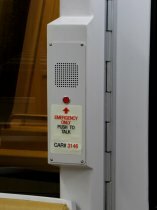 Center emergency intercoms: The 6000-Series is the only car type to contain emergency intercoms at the center of the car, beneath the door release handle. 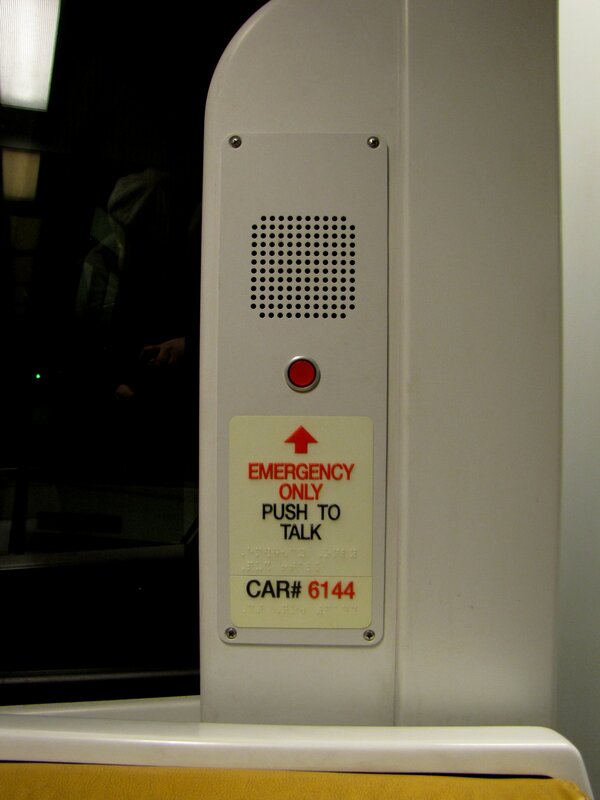 Arrival: 6000-Series cars make a high-pitched whining sound, which changes in pitch as the train comes to a stop. The sound is nearly identical to that of the 2000 and 3000-Series cars. 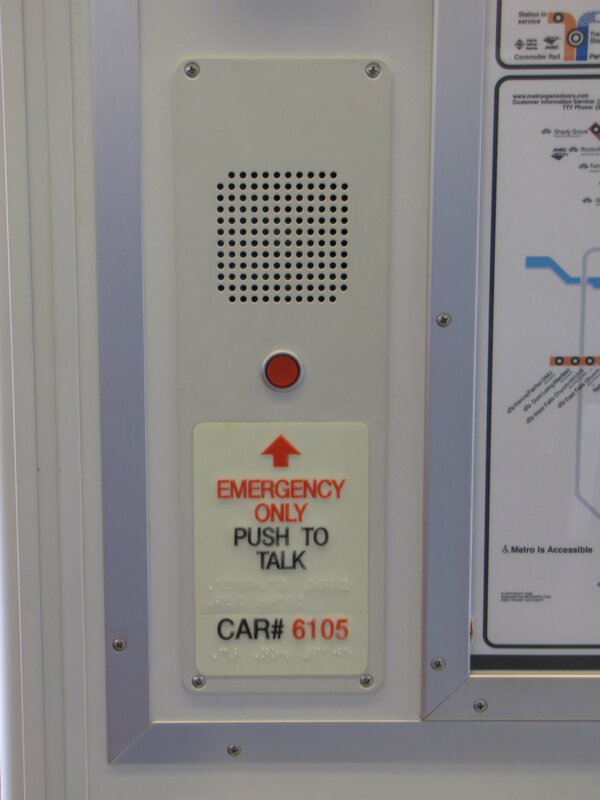 Departure: 6000-Series cars make a high-pitched whining sound, which changes in pitch as the train accelerates. The sound is nearly identical to that of the 2000 and 3000-Series cars.